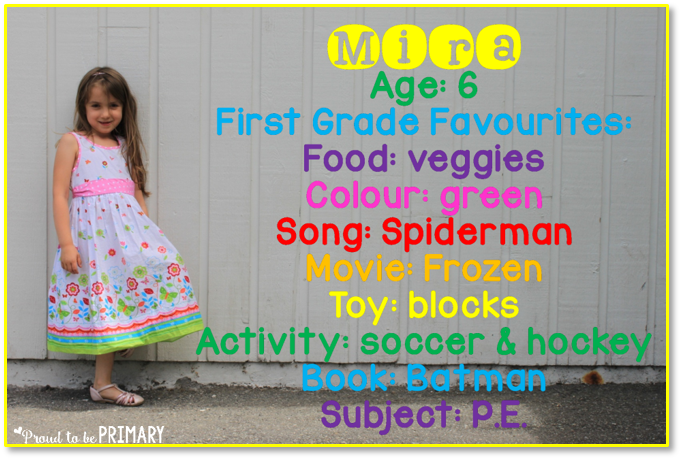 An end of the year school picture keepsake and survey idea. 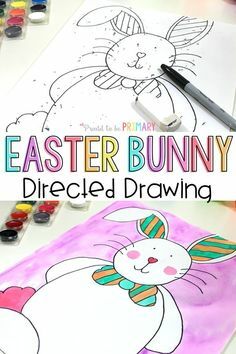 It’s super easy and fun! All you need is a camera and a little knowledge of Powerpoint! 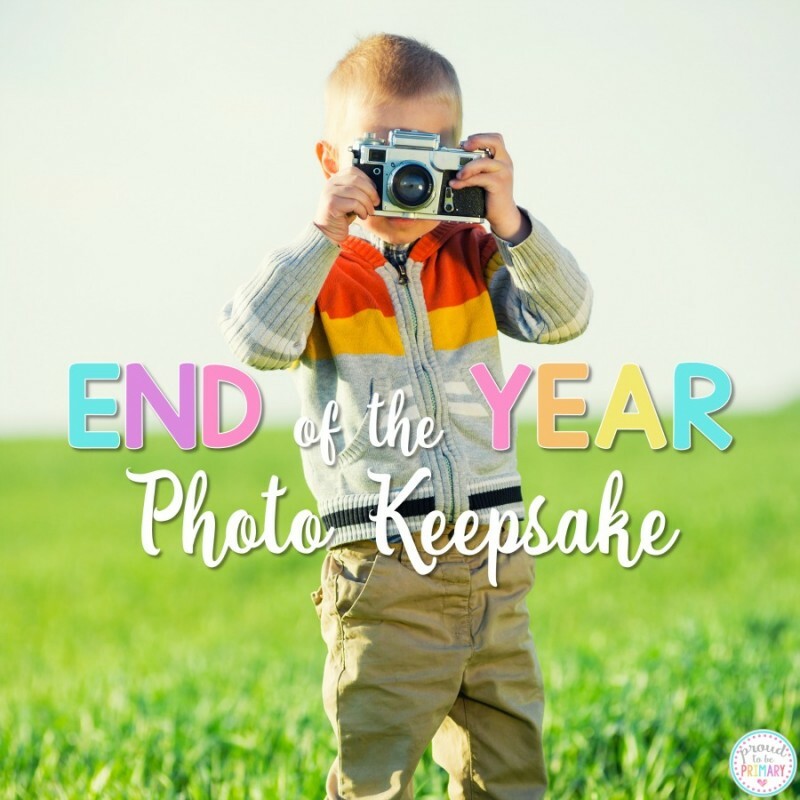 Today I am sharing my favorite end of the year photo keepsake and survey idea. 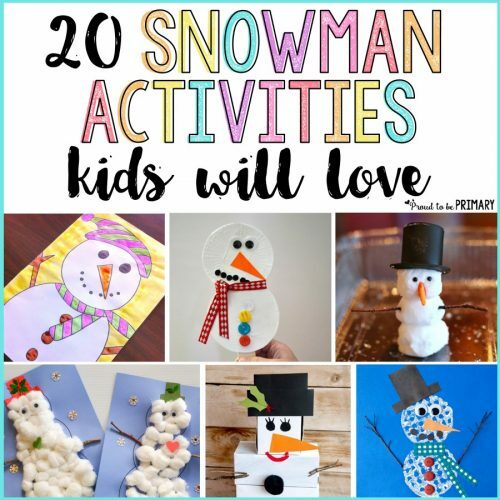 It’s super easy and fun! 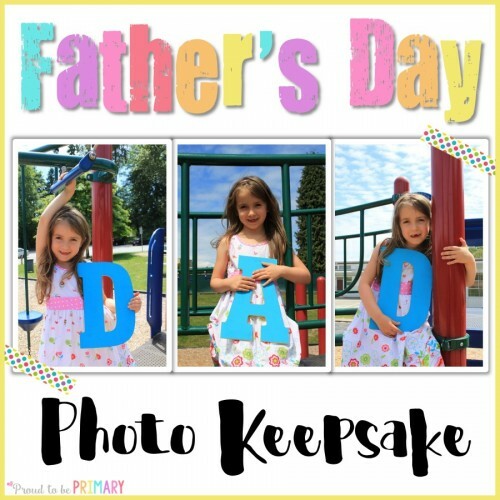 All you need is a camera (any kind or phone will do), kids, and a background location. I recommend going outside and using the natural light. Take your students outside of the classroom on a nice day and find a place with a large wall. Ask your students to stand against the wall and take pictures with them posing. Take the shots so that the children are on to the right or left of the frame. I always take two different poses or shots just in case one does not turn out and you have a backup. 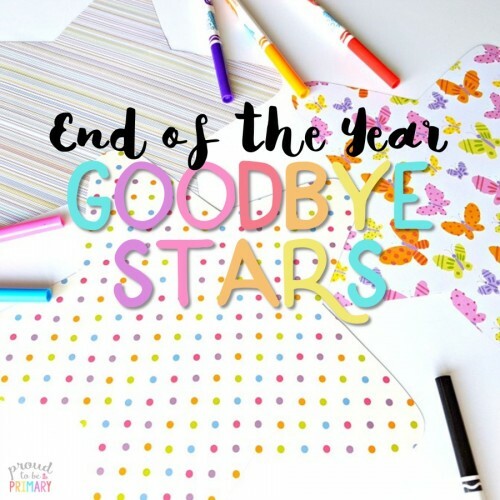 Give your students a copy of the End of the Year Survey and have them fill it out with their favourite things. Take the completed forms home with you for your photo editing later. 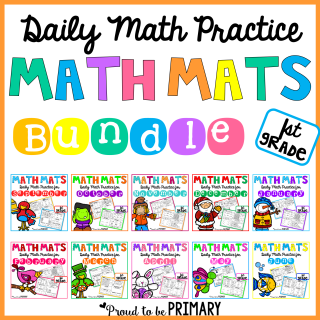 The survey sheets below are available for PreK to fourth grade and are included in a FREEBIE below. Upload your photos onto your computer and open an editing program, like PowerPoint. Insert a photo and add a text box. Type the information from the completed survey. I used a few of my favourite KG fonts (Red Hands and Wake Me Up) and the colours of the rainbow to customize the text. Duplicate the slide, change the photo, and adjust the text for each student. When you have completed all the photo editing. I suggest printing on white card stock in colour or photo paper. 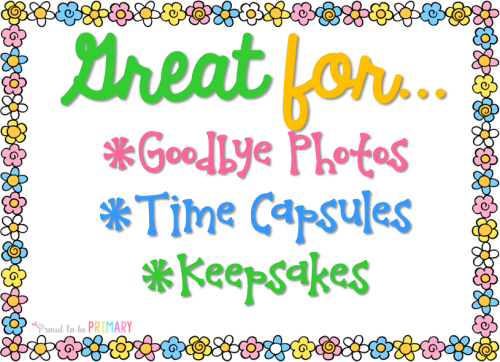 Include these photos with your end of the year gifts or time capsules for students. It makes a great keepsake! If you would like a copy of the end of the year survey, you can grab the FREEBIE by clicking the image below! 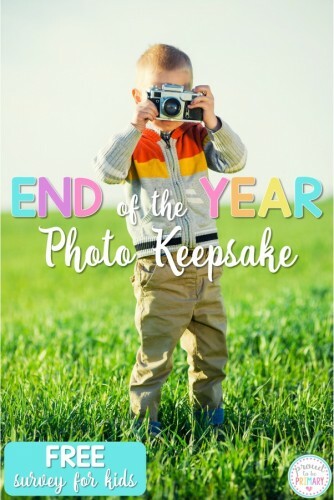 I hope you enjoy making these simple, fun end of the year photo keepsakes for your students. Your students and parents will thank you. 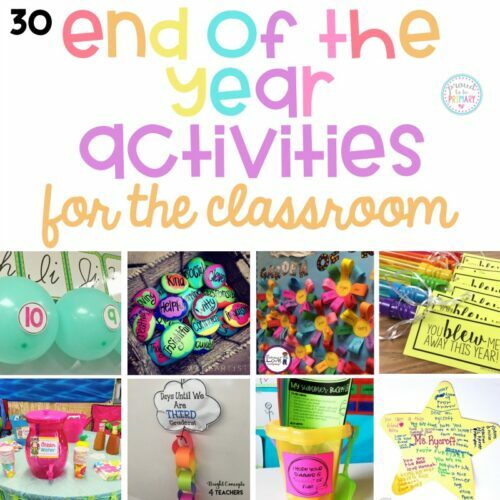 Looking for more FUN ways to end the school year with your students? I am thrilled to show you Writing and Words for the whole year! 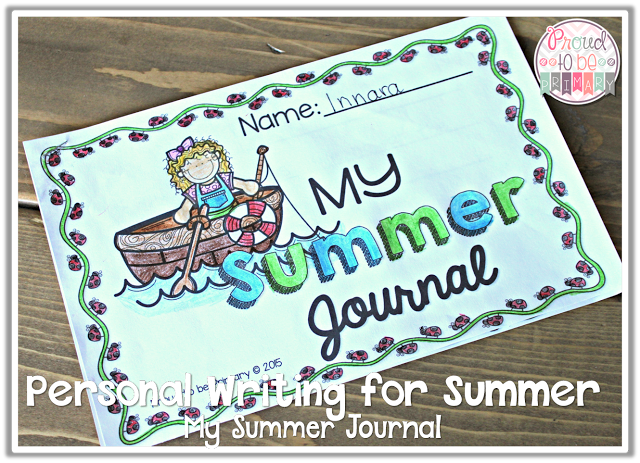 It is filled with activities for your writing and words blocks. 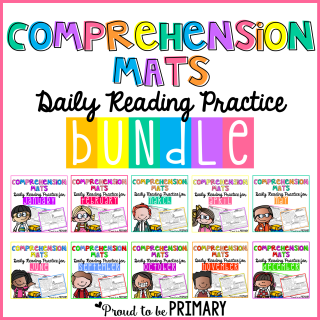 Whether you teach writing lessons to your students like I do or if you have a writing center or do Daily 5, these products are for you! 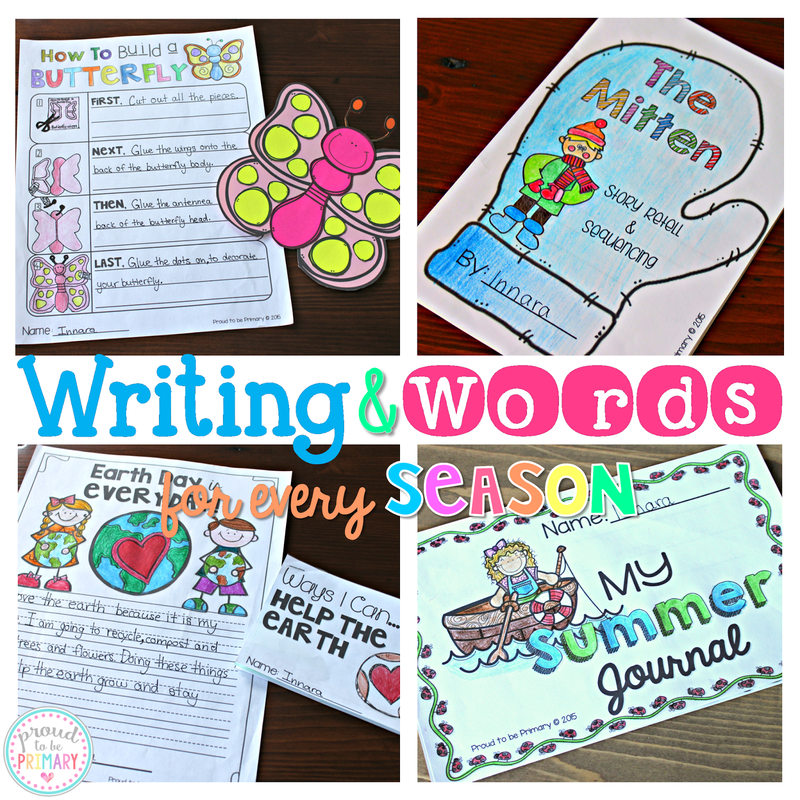 Each Writing & Words pack has 100+ pages filled with writing and word activities to keep your students busy learning all season long. 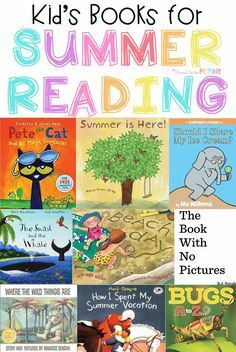 Many of the activities pair well with fiction and non-fiction seasonal books available in your library. There is a big variety of writing topics and genres to choose from. You will have different lessons to teach for years to come! 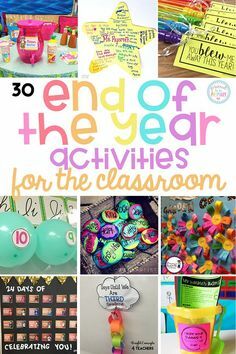 There are also lesson suggestions provided for the activities. 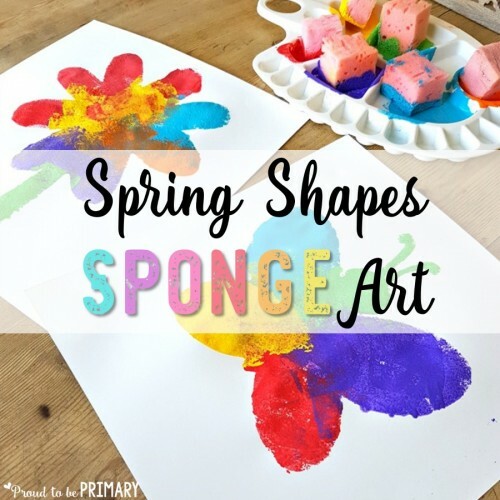 2 of the activities include templates to print to create a craft. 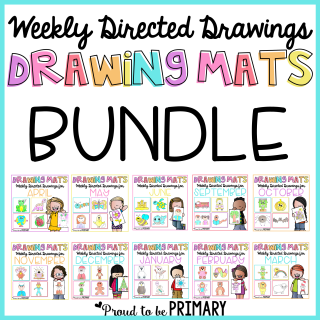 These templates would look great with photographs of your students on them for a fun twist! 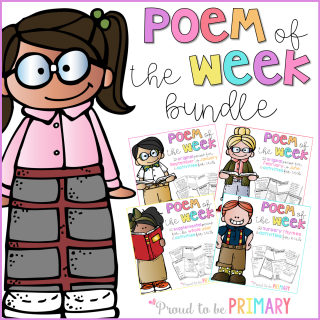 3 poetry writing templates are included with lesson ideas in each writing and words pack. 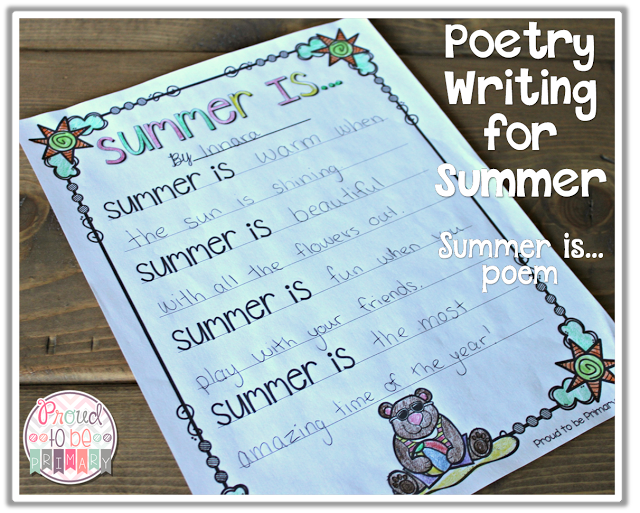 All poem types are easy to teach and fun for kids! 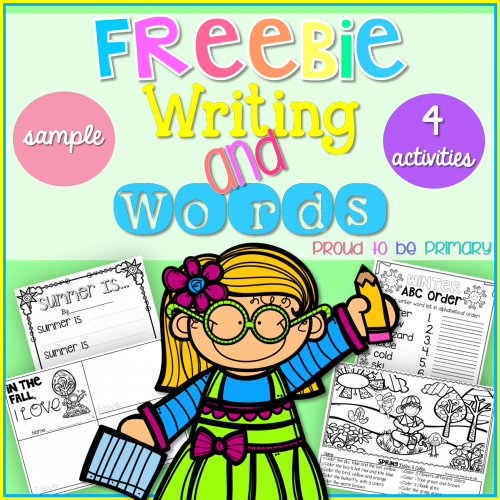 There are 4 personal writing activities in each writing and words pack. 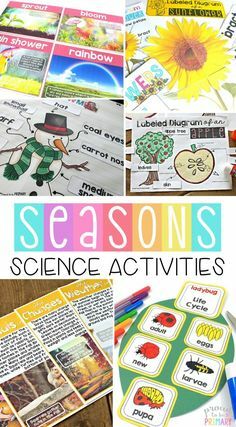 The writing topics are suited to the events of the season. 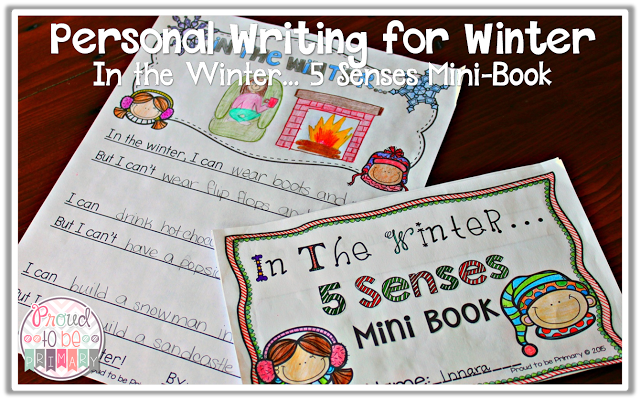 One of the lessons is to make a 5 senses mini-book about the season. 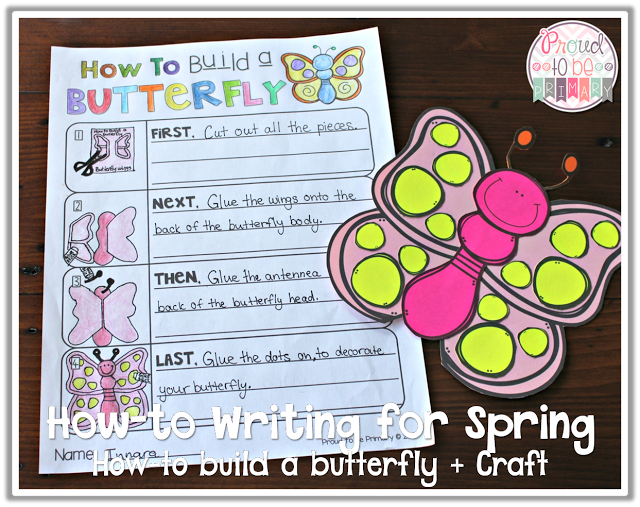 There are 3 how-to writing activities in each writing and words pack. 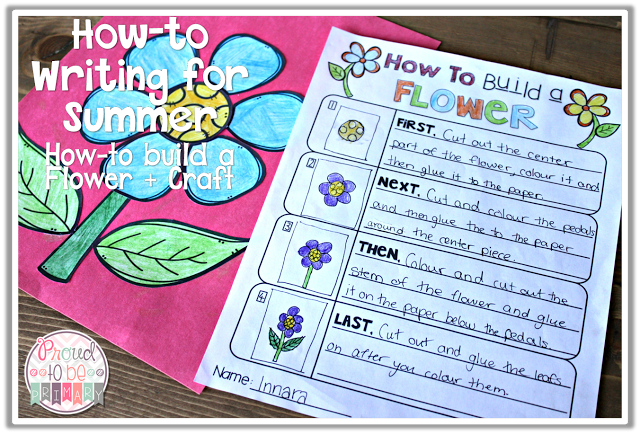 One of the how-to writing lessons in each pack includes a craft to make to go with a writing activity. 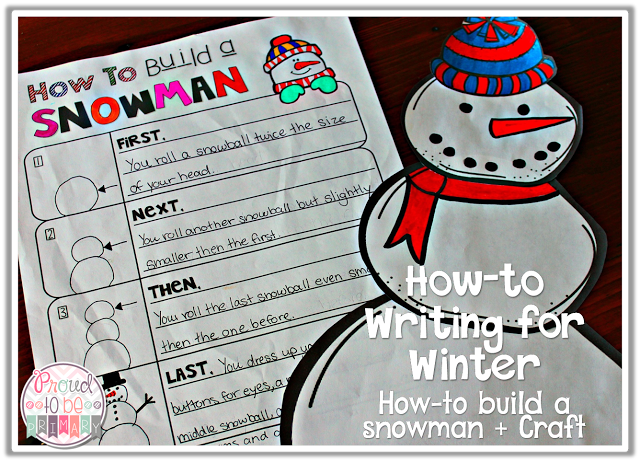 How to build a snowman with craft pieces to make a snowman (available in Winter Writing & Words). 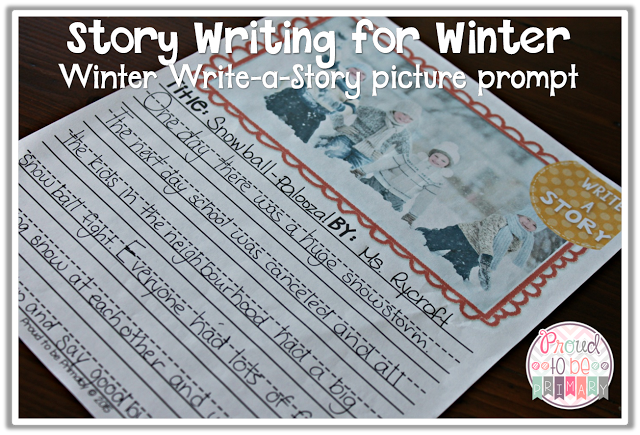 There are 4 story writing picture prompts in each writing and words pack, as well as a create-a-story board with pictures and words and a writing template. 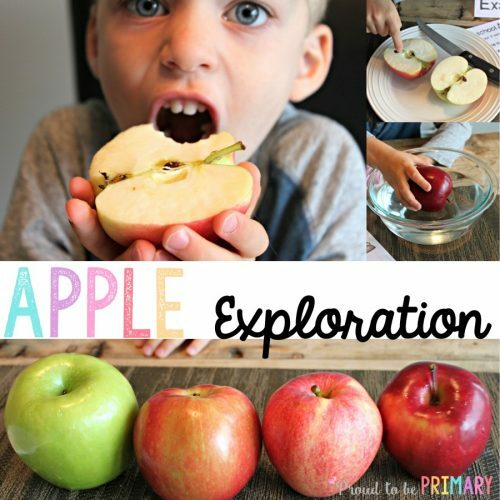 These activities are helpful when teaching your students how to write a story about the pictures and words provided. 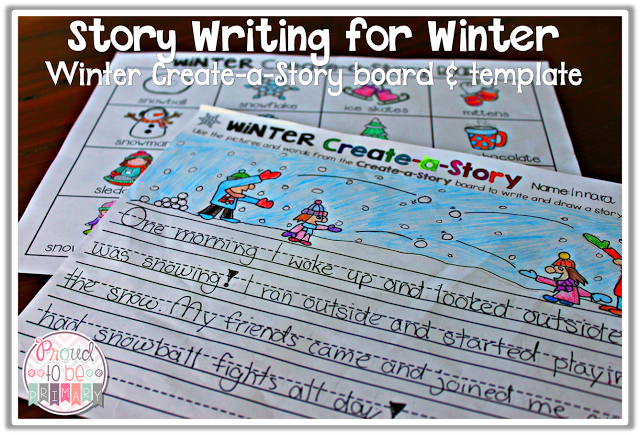 Create-a-Story board and writing paper (available in all Writing & Words packs). 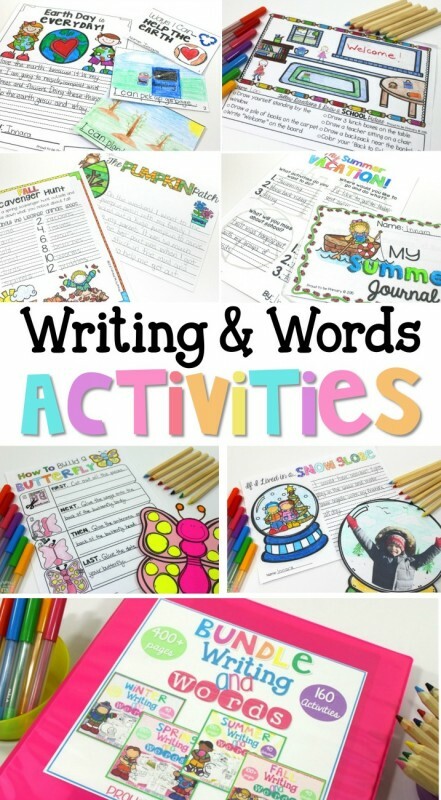 There are 3 story response writing activities in each Writing & Words pack. 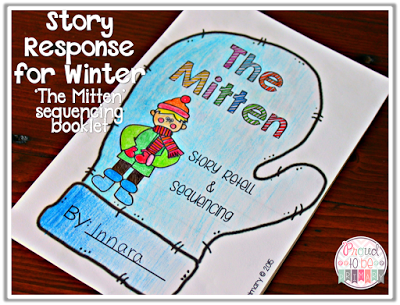 The story responses include a beginning/middle/end activity, a sequencing activity based on a popular book, and a story map. 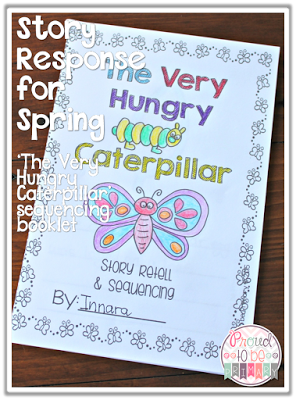 ‘The Very Hungry Caterpillar’ sequencing booklet (available in Spring Writing & Words). 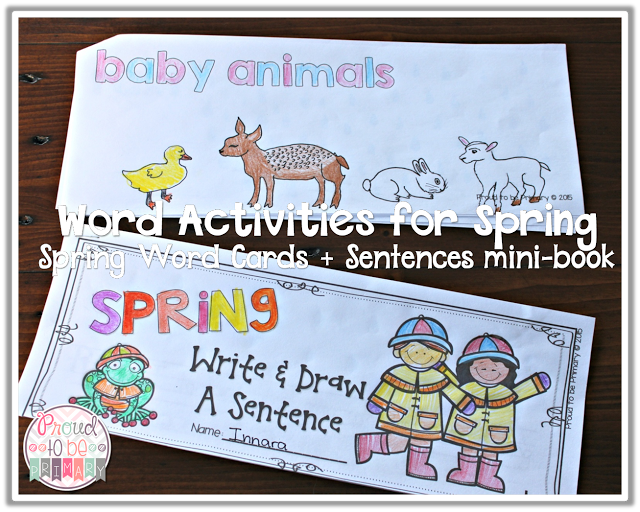 There are also many word activities that are great for word work time, morning work, or fast finisher activities. 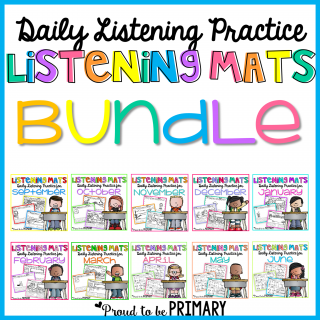 There are also 3 following instruction activities included to help your students build their listening skills and ability to follow instructions. 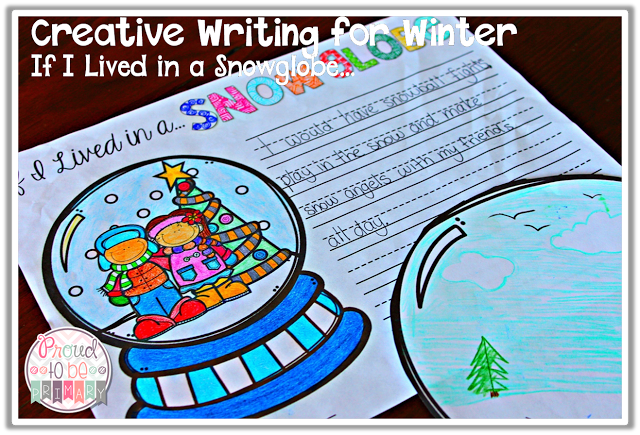 Visualize & Draw – Read a seasonal story and illustrate. 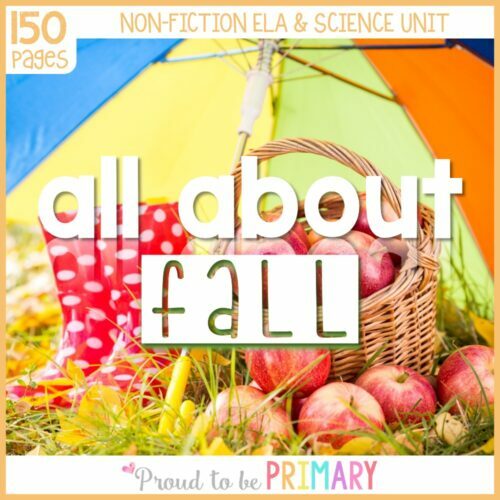 Listen & Color – Read the instructions and color parts of the seasonal picture. 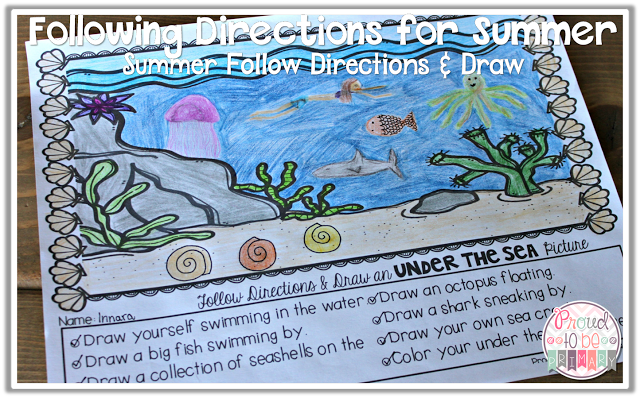 Follow Directions & Draw – Read the instructions and draw items onto the seasonal background. 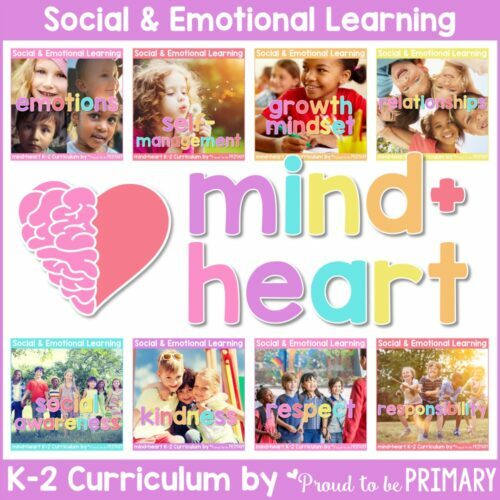 The activities align to the Common Core standards for K through 2nd grade.This is perfect for first grade, but could also be used for Kindergarten through 2nd grade. If you would like to try out a FREE sample of Writing & Words, click the image below. 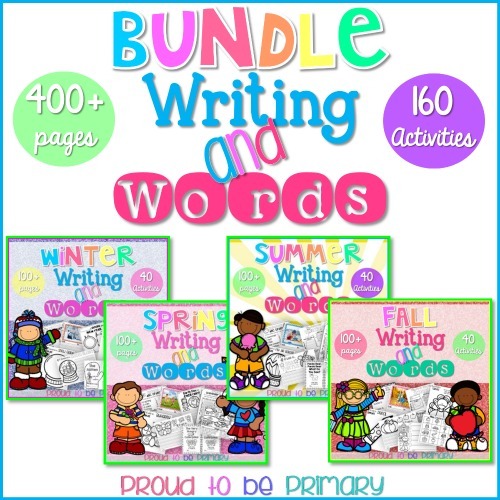 If you are interested in these writing activities, you can grab the Writing & Words Bundle. 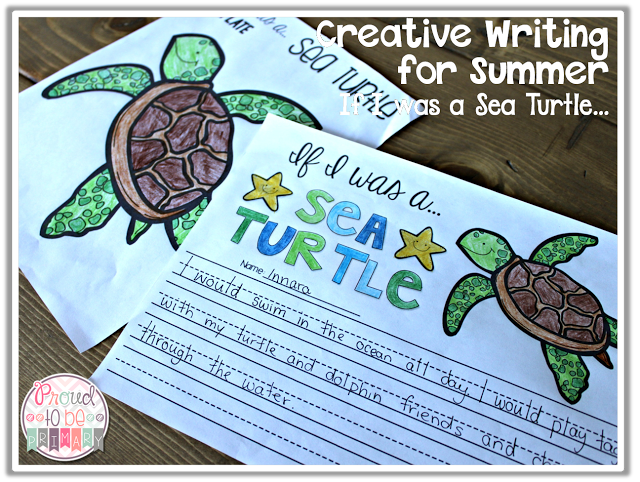 I love teaching writing and the Writing and Words for the whole year activities have helped me so much. I hope they are what you are looking for! 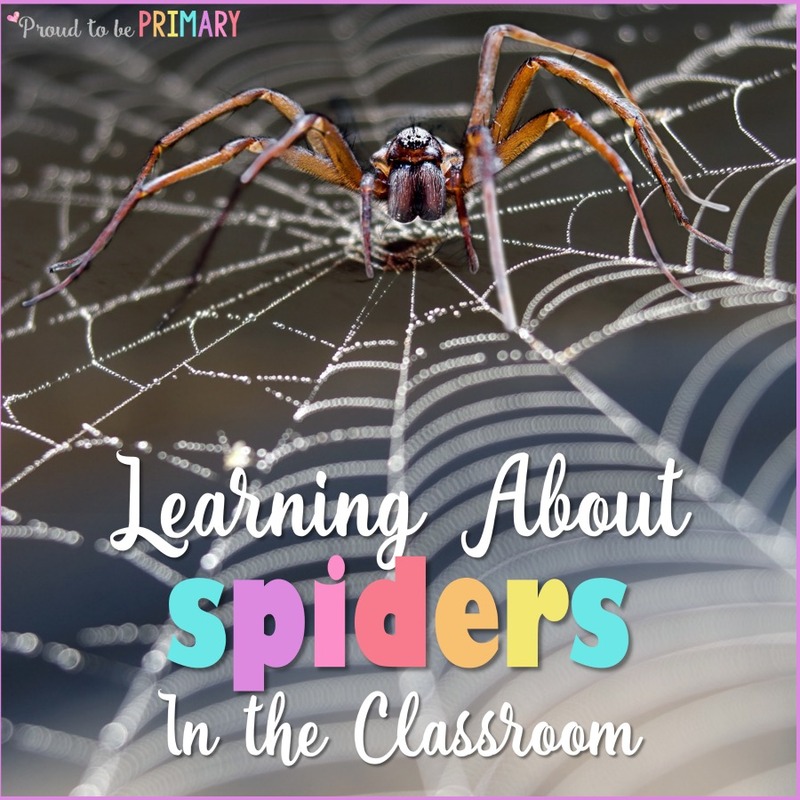 Classroom lessons for learning all about spiders. 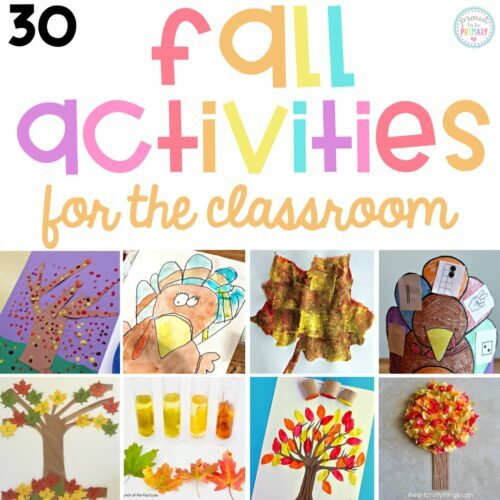 Activities include art, reading, vocabulary building, labeled diagrams, and more. Each year my first and second graders enjoy learning about spiders once fall hits. Spiders are everywhere and we like to learn about their world. We learn a ton of new things and really change our viewpoints about spiders. 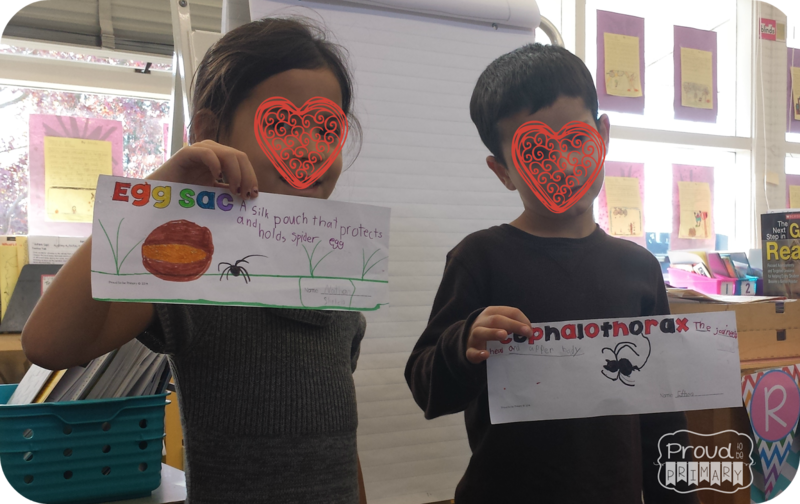 We start our unit by sharing what we already know about spiders. We come up with “I wonder…” questions with a partner. 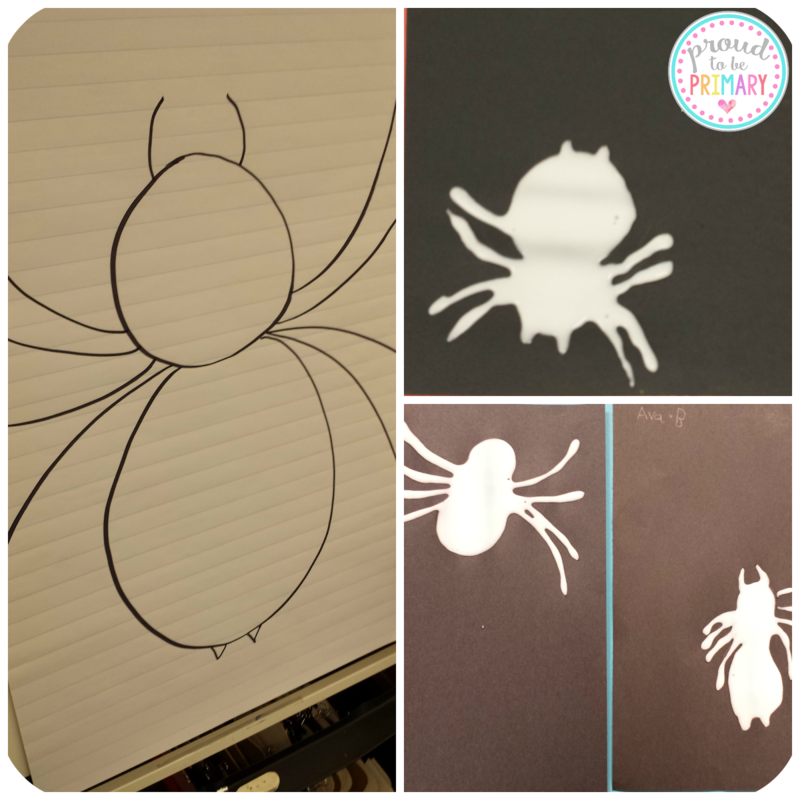 We learn how to draw a spider on black construction paper, which we fill in with white glue. You will need to wait until the spiders dry completely before moving to making the backgrounds (It took 4 days for some of those BIG spiders to dry). 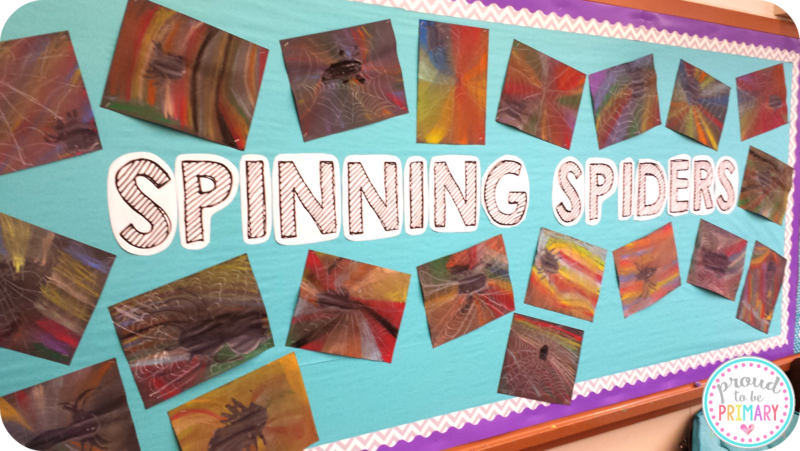 Everyone’s Spinning Spider art came out unique and colourful! 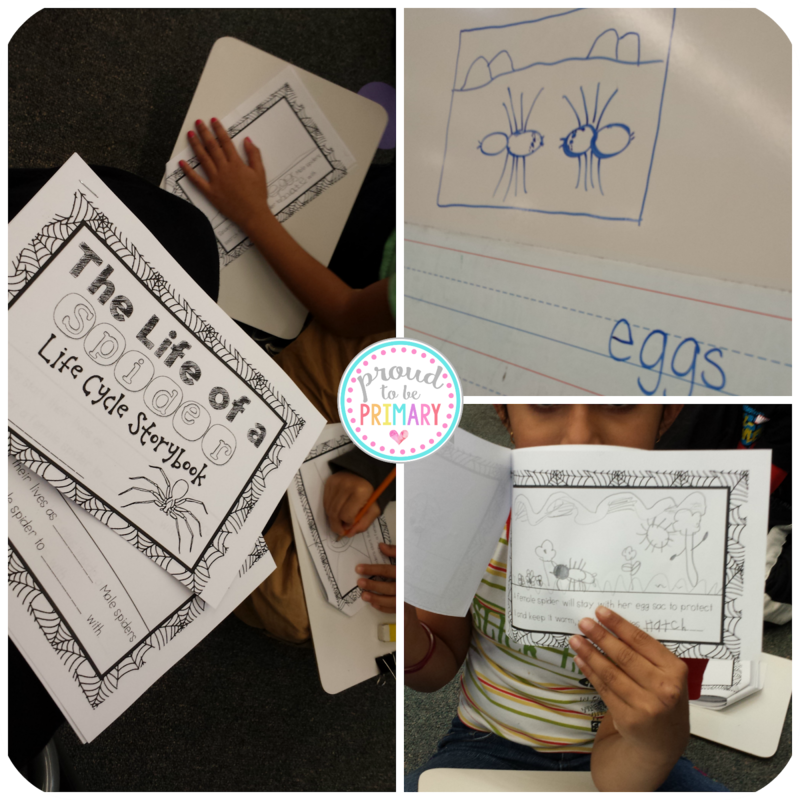 We learn about a spider’s life cycle by completing ‘The Life of a Spider” Storybook. I start the lesson by reading and discussing a non-fiction book about the life cycle. 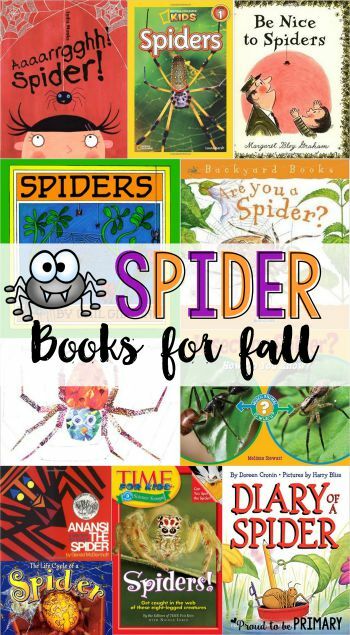 I have a huge list of valuable spider read aloud books in a post HERE. We sit together at the carpet with our books and pencils ready to fill in words and draw pictures to represent the different stages of the cycle. 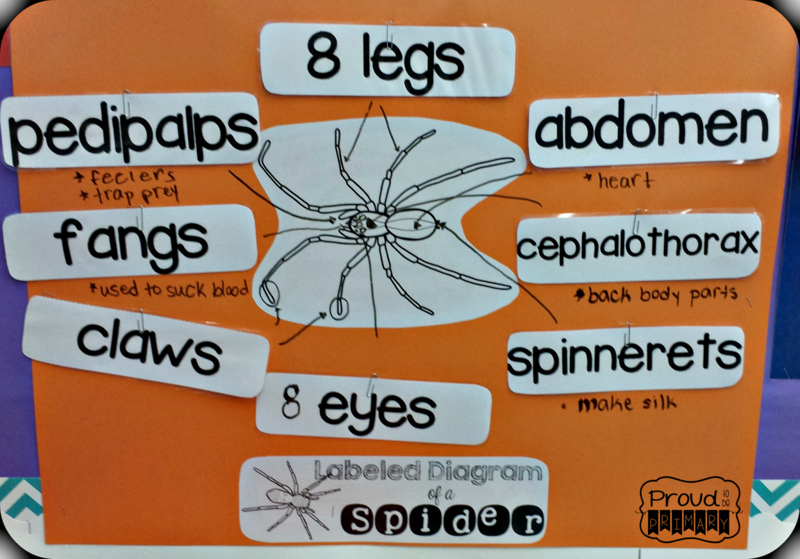 We learn about spider vocabulary and how to use a glossary. I give pairs of students a few words that they were to look up in the glossary of a non-fiction book about spiders. 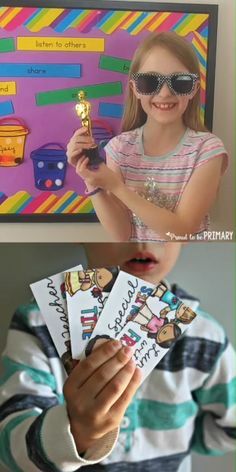 They write the definition on a word card and illustrate the meaning. To read more about how I teach vocabulary with theme words HERE. After some practice reading and explaining their vocabulary word, students share their words with the class. 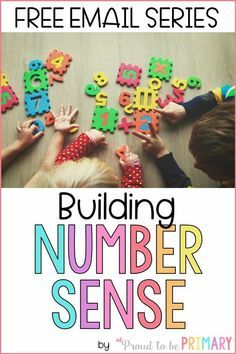 This is a great way to have them learn new words, rather than just telling them, which doesn’t necessarily stick into memory. To learn about the difference between facts and opinions, we play a game using our whiteboards together at the carpet. We first discuss what facts and opinions are and share some real-world examples. To play this game, I read a sentence about spiders aloud and they put down either ‘F’ or ‘O’ as their guess. They can keep track of their “score” and give themselves a point for each one they get correct. They share their answers as the game goes on. 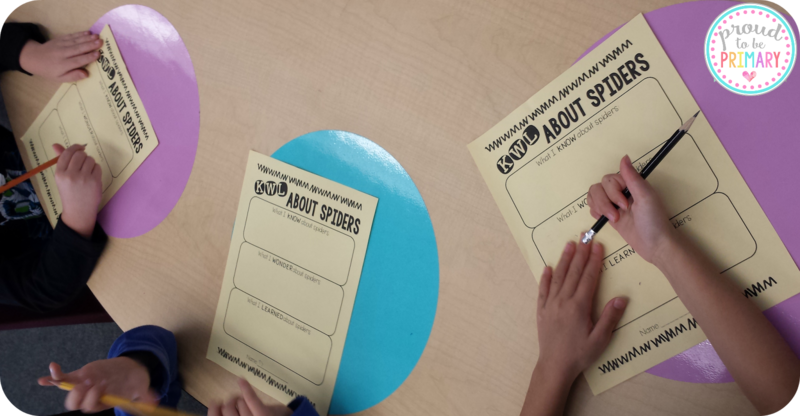 After the game, they work in pairs to cut out the same spider facts and opinions and sort them correctly on a sheet. I found that this was a great way to check student learning. 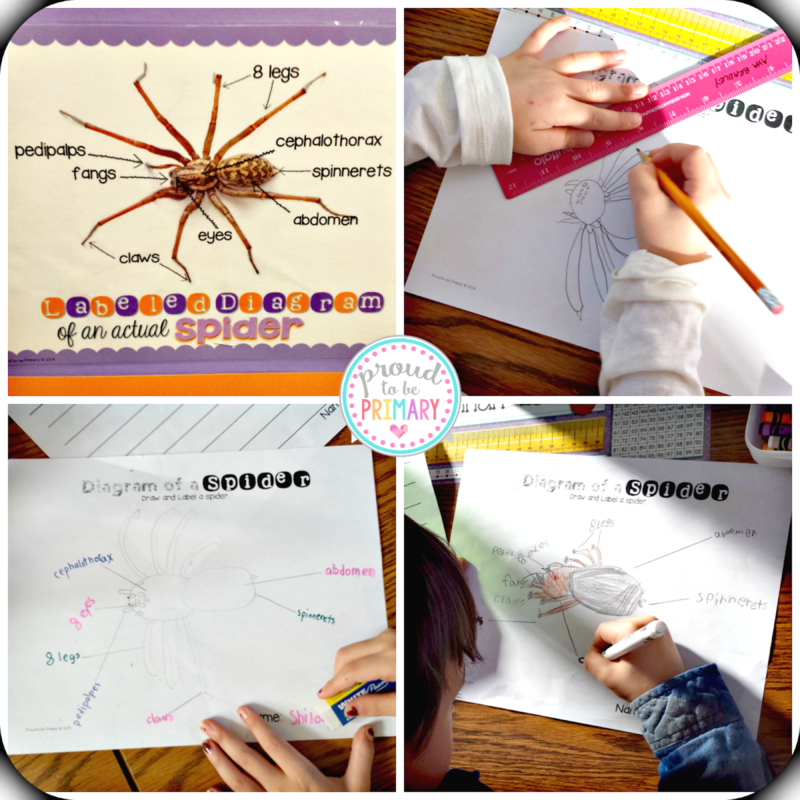 We learn about the parts of a spider and their uses. 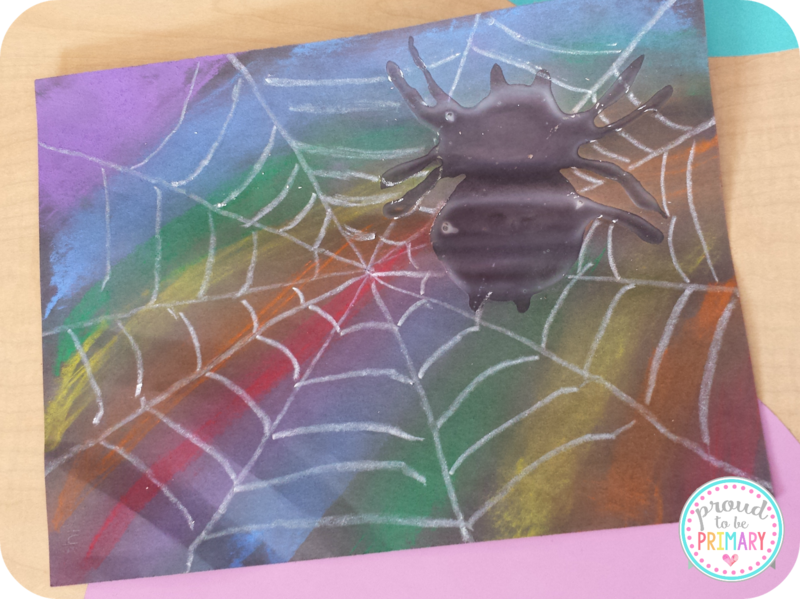 We discuss the differences between spiders and insects (i.e. Insects have 6 legs, 3 body parts, wings). I use this information to teach my students about the parts of a spider. 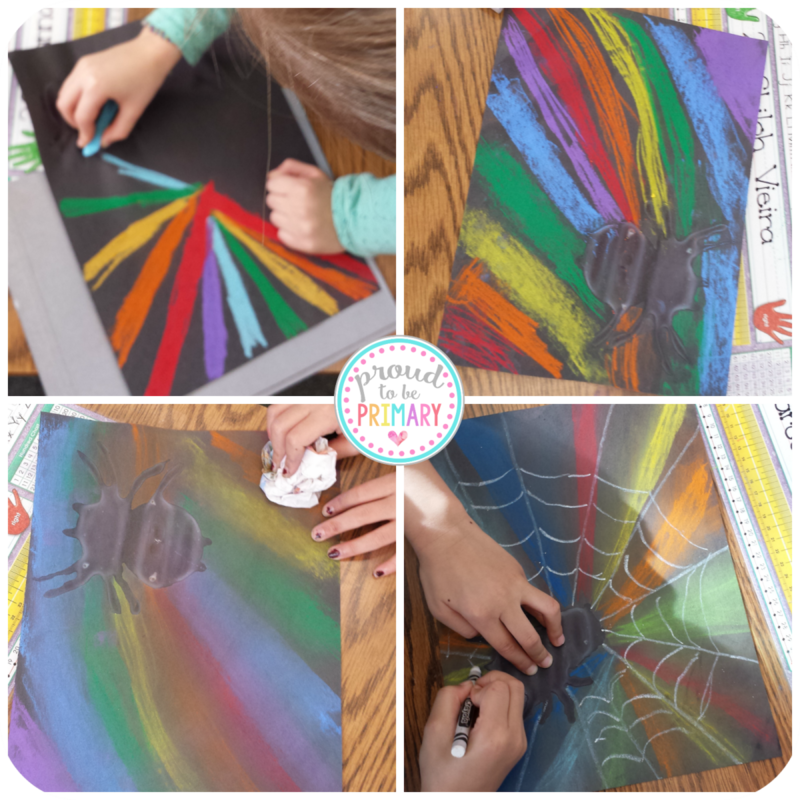 We draw our own spiders with its many important parts, use rulers to create labels, write the parts down, and colour our spiders. 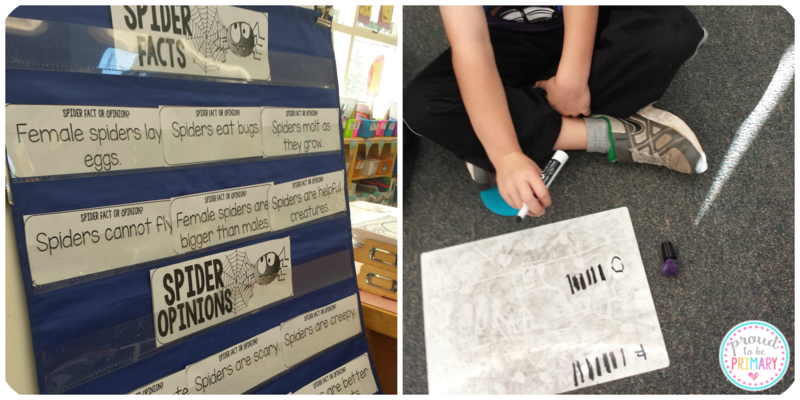 Throughout the unit, we record the things we learn about spiders on our can, have, are chart. 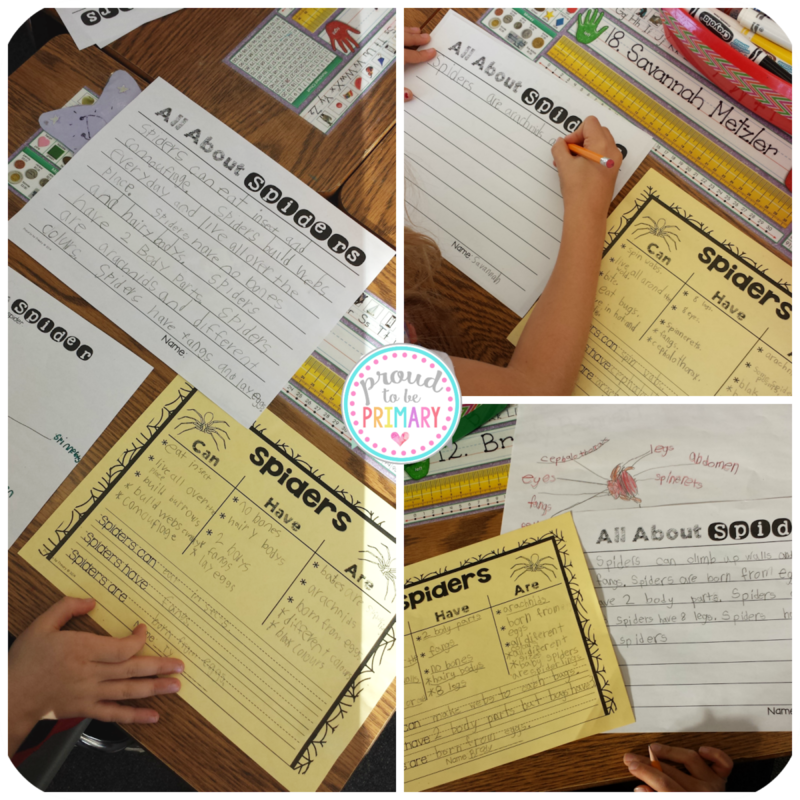 We read parts of the spider fact sheets and locate facts that would fit into one of the categories. We share those together. As a culminating activity, we take the information we recorded on our can, have, are sheets, as well as the new info in our brains, and write our ideas into sentences. 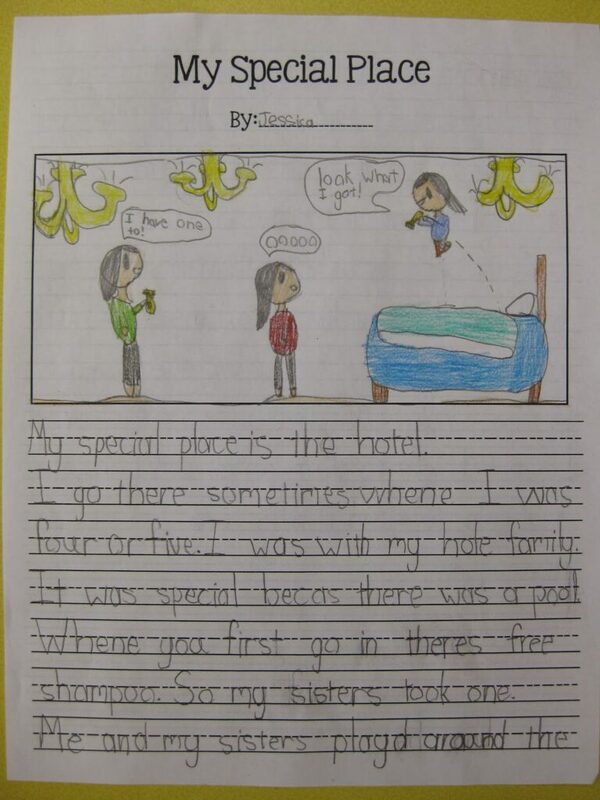 Some students write a paragraph with a beginning, middle, and end. 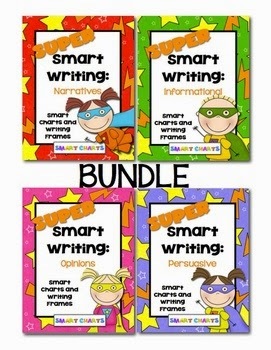 I use these writing samples as an assessment for our report cards. 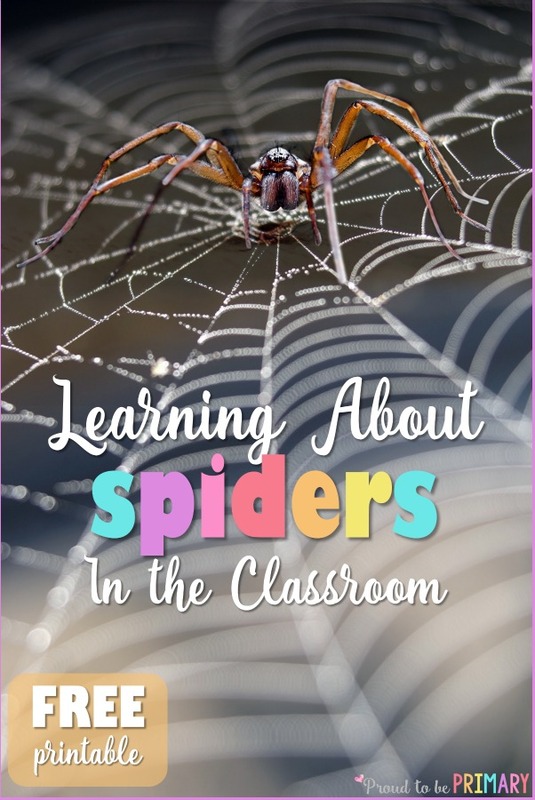 All of these lessons plus many more come from my All About Spiders pack. It is 140 pages and geared towards first through third grade (I used it in my 1/2 combined class). 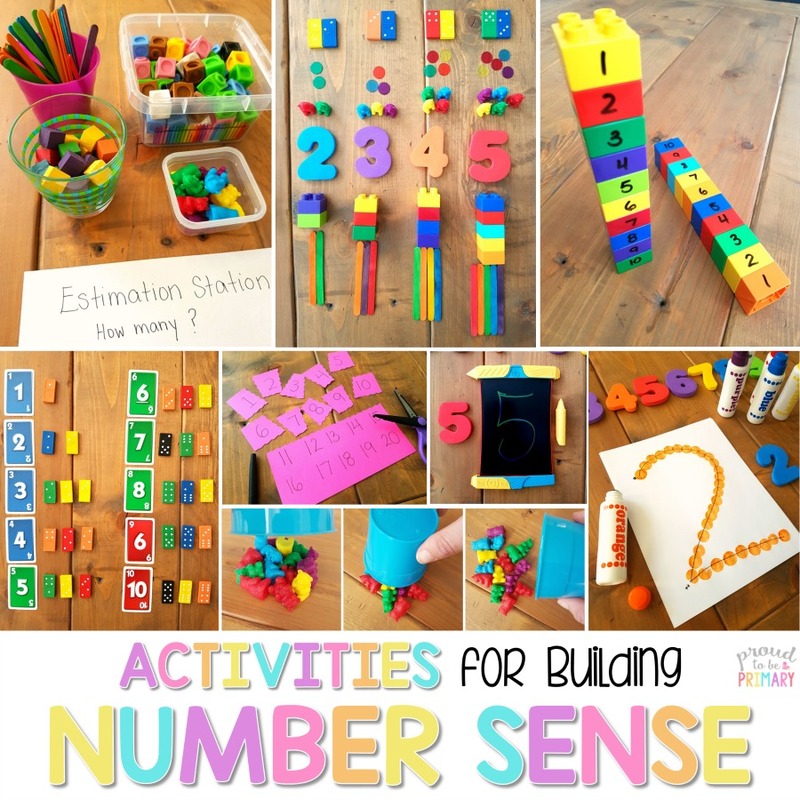 The activities lend themselves easily to differentiating and there is tons of variety for you to pick through! 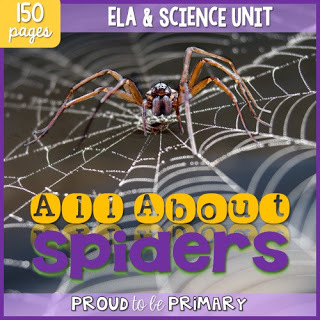 You can get this spider unit above along with 15 other non-fiction & science units with similar activities in the Non-Fiction & Science Bundle for the Entire Year HERE. 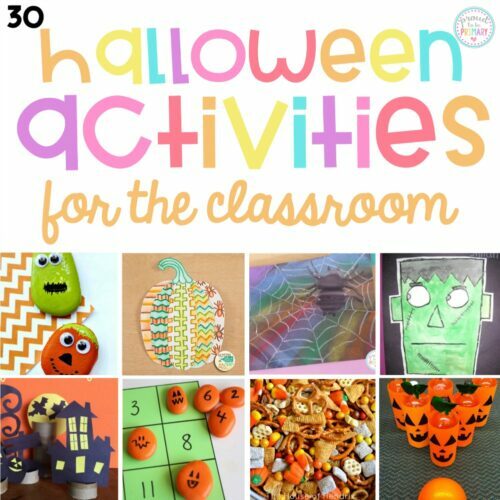 Grab a spider freebie with a sample of the activities provided in the larger unit by clicking the image below! Check out this list of must-have books to support your study of spiders. 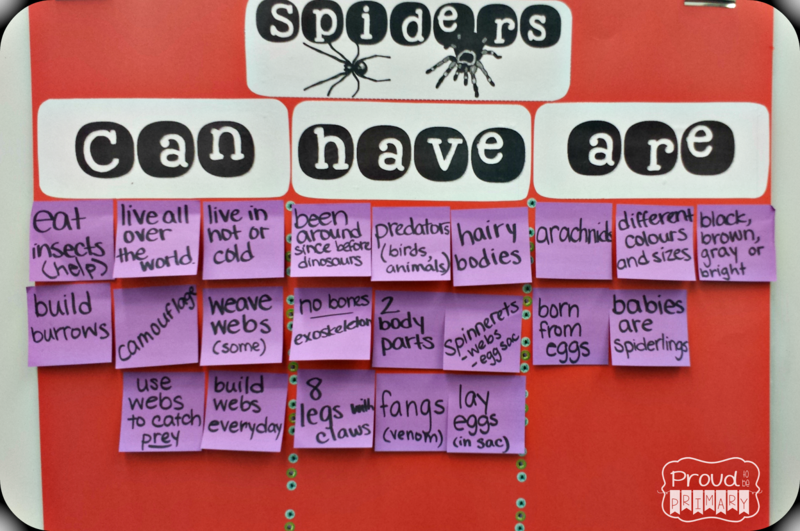 What are your favorite spider activities for the classroom? How do you teach all about spiders? 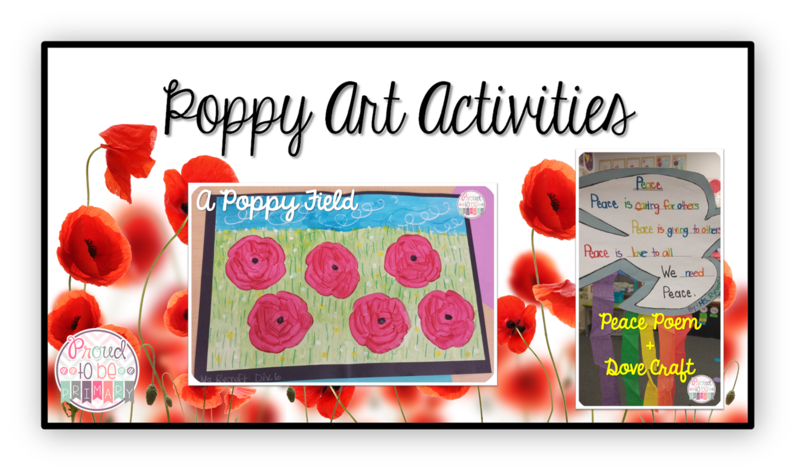 Peace Activities for Remembrance Day (Canada) or even Veteran’s Day (U.S), includes a writing lesson and FREE peace writing template and poppy art. 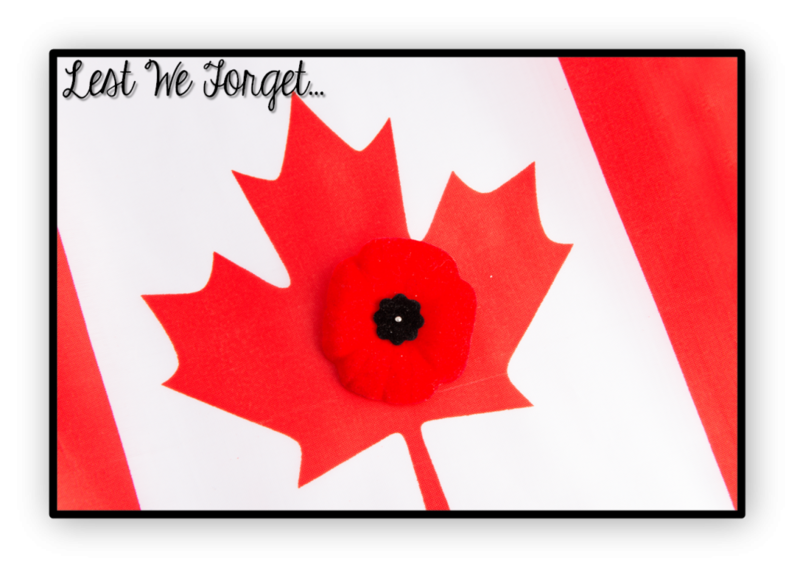 November 11th is Remembrance Day in Canada. It is a day to remember those who have fought and died for our country. We pay our respects each year with a minute of silence at 11 a.m. and we each wear a poppy over our hearts. 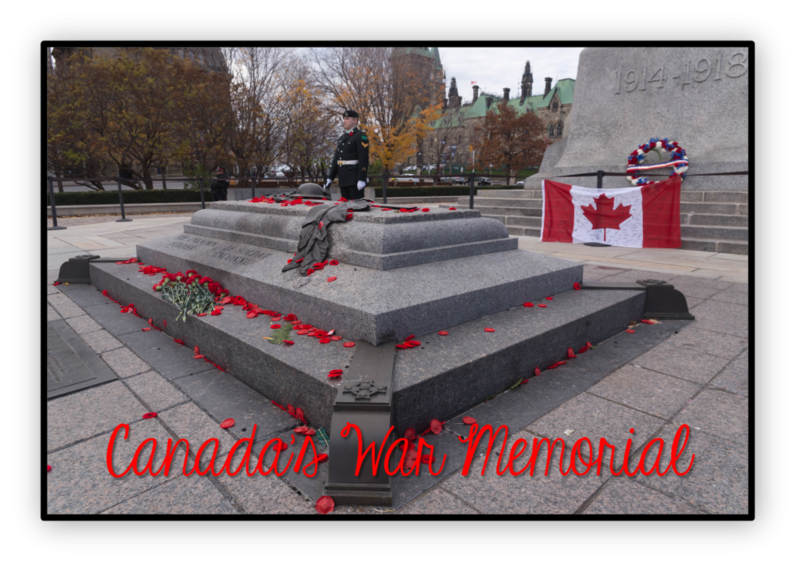 This year (November 11th, 2014) feels different to me… In October, at the War Memorial in Ottawa, we suffered a tragedy. This event happened in our own country, not overseas. 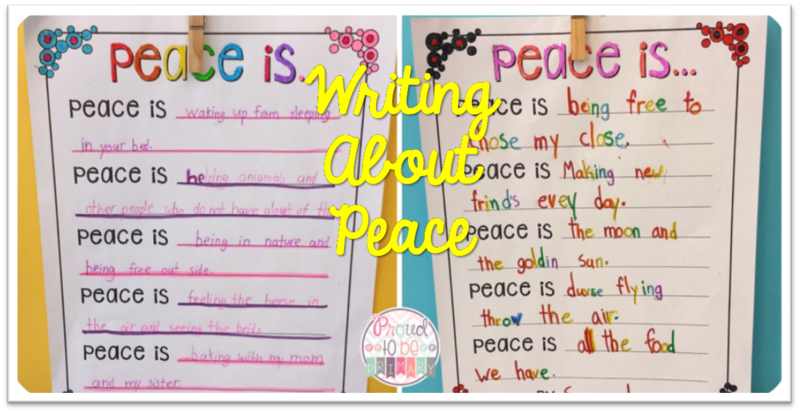 Even though I cannot and will not explain what happened to my students, I felt more inclined to teach them about Remembrance Day and to have open discussions about peace. My school has a special assembly the day before Remembrance Day to illustrate to children the importance of this day and so that they may learn about our history. We share writing and poetry. Also, we read ‘In Flanders Fields’ by Sir John McCrae. 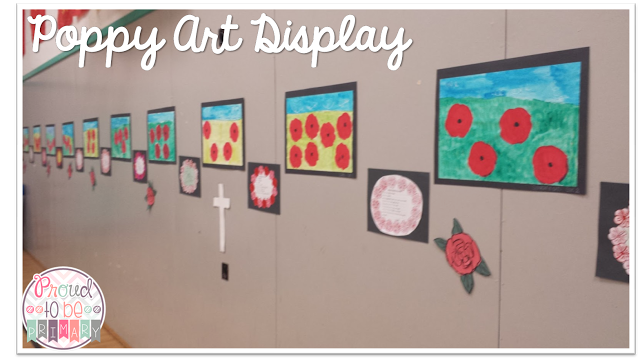 Then, we makewreathss with poppies in our classrooms to share during the assembly and line our hallways with artwork. 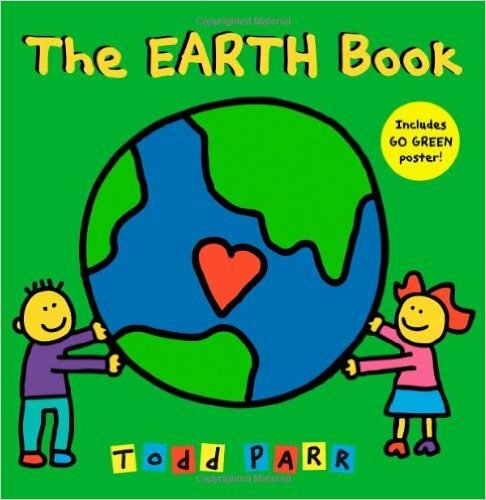 I love Todd Parr books and ‘The Peace Book‘ is the perfect simple story that clearly illustrates what peace is in a child’s world. 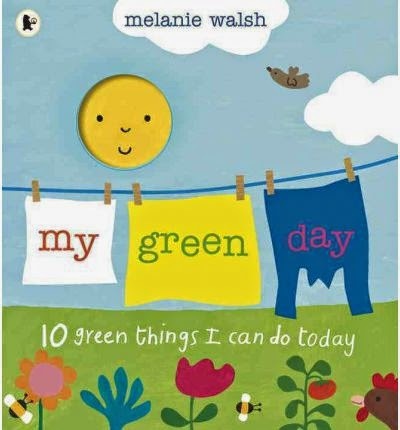 This is often a hard topic to explain, but this book lends itself nicely to many topics for discussions that children understand and can relate to. We brainstorm everything that peace is to us on a chart. 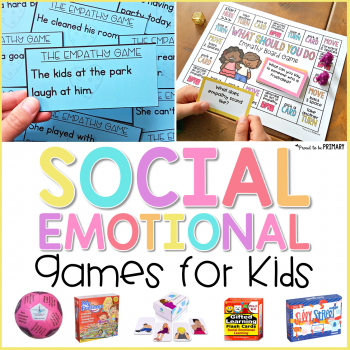 Students are encouraged to use descriptive language and express their emotions. caring for all the animals and creatures of the Earth! playing at the beach in the warm sun. having a place to live and food to eat. donating and giving to others in need. 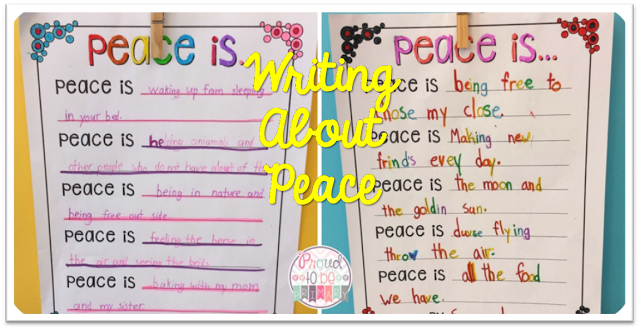 We use those ideas to craft our own sentences and poems about peace. We use the sentence starter ‘Peace is…’ They express what peace means to them in sentences. Each poem turns out so unique and expressions of their personalities. 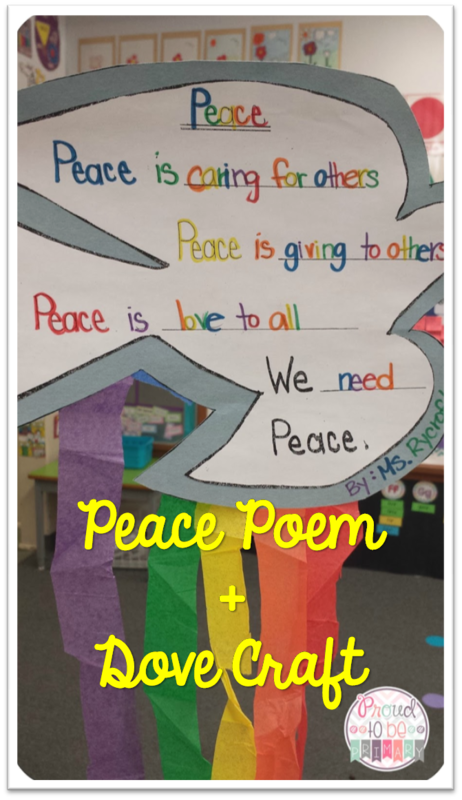 Here are some examples of peace poems created by first graders. 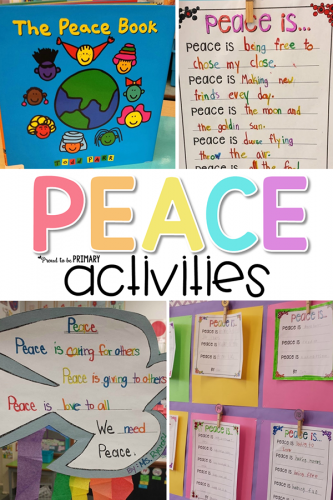 If you would like a copy of the ‘Peace Is’ templates, click the image below. 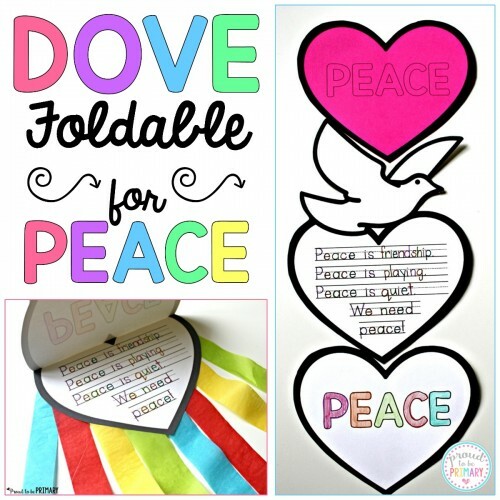 Another peace activity is to take our peace ideas and write poems in the shape of a dove. I have them attach pieces of tissue paper in rainbow order to the bottom of the doves and I hang them around the room. 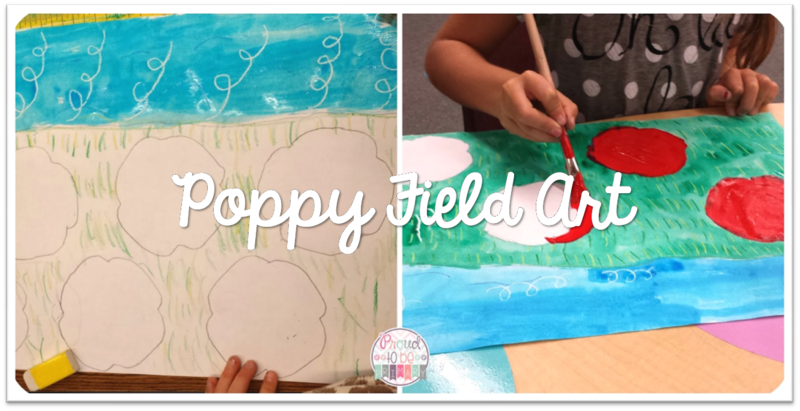 Since the poppy is an important symbol for Remembrance Day, I like to do an art activity illustrating the beauty of these flowers. 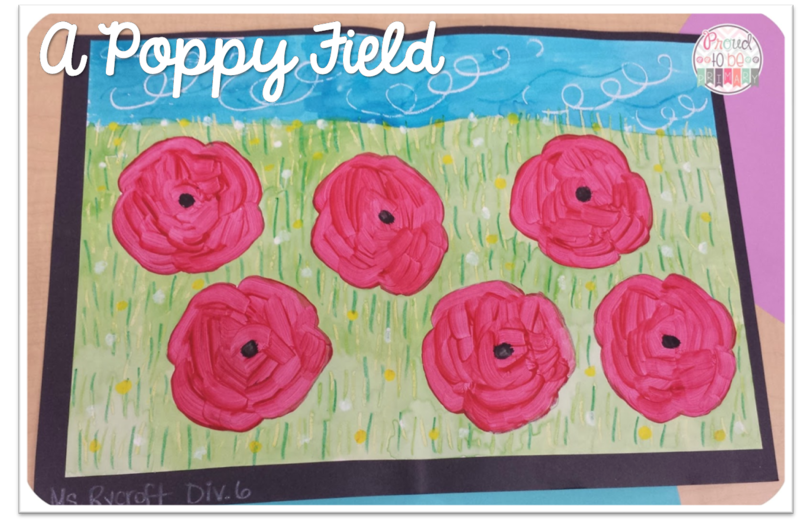 My favourite art lesson is to illustrate a poppy field using crayons, watercolor paint, and tempura paint. 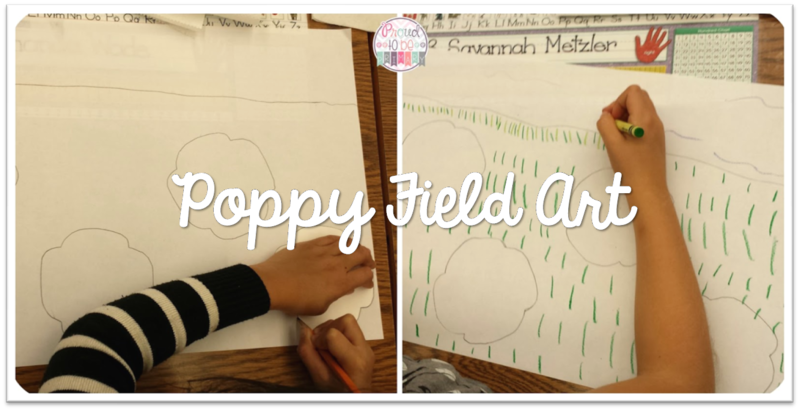 First, we draw a horizon line and use poppy shaped tracers to draw poppies on a field. Next, we use white and blue crayons to draw wind and movement in the sky. Then, we use different shades of green to draw the blades of grass all over the field. They paint over the sky with blue and the field with green, leaving the poppies blank. Then, we use red tempura paint to paint the poppies so they pop out and look bright against the watercolor background. Then we finish it off with the black poppy center. Here is a finished example. Our artwork posted in the school gym. Thank you for stopping by to read Peace Activities for Remembrance Day and Veteran’s Day. 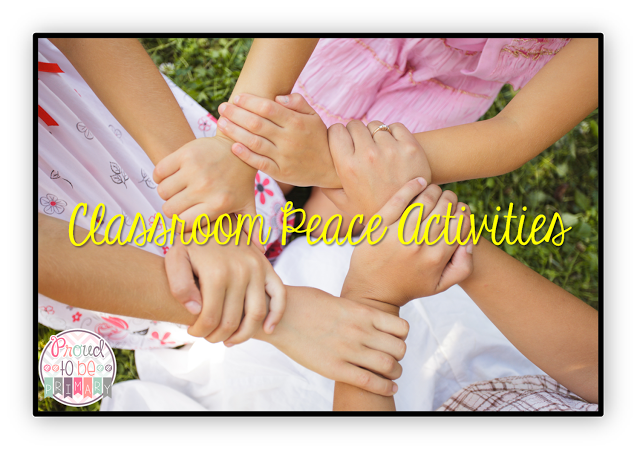 I hope that you have gained a lesson or two that you can use in your classroom to teach your students about these important events and celebrate and encourage peace. 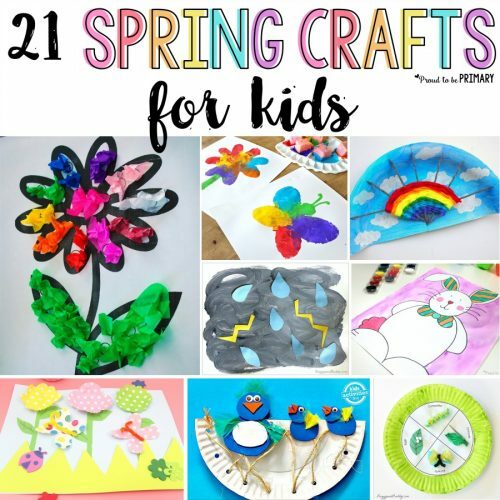 Looking for More Craft Ideas? 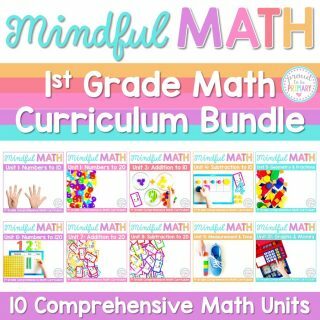 Teaching whales for kids? 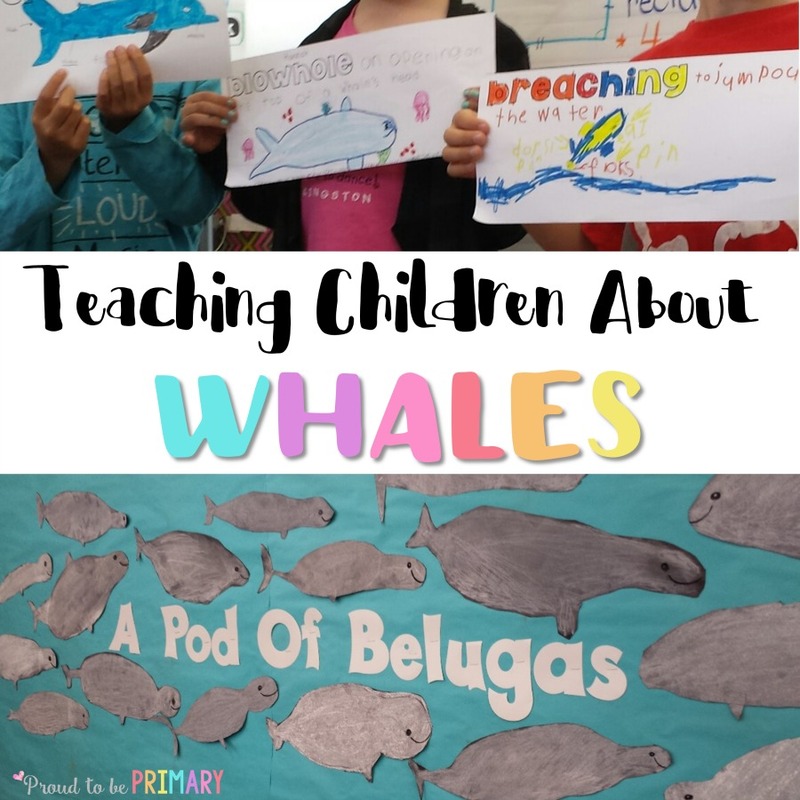 Read this post for a beluga directed drawing idea, activity to build whale vocabulary, and engage your primary students in science and ELA lessons. Whales are by far my most favourite animal! They are completely amazing! Not only do they live in our oceans, but they are they the largest animals in the world. I love teaching kids about whales and sharing my own enthusiasm and amazement over these majestic creatures. Just like with any new science unit, we start off by sharing what we already know. 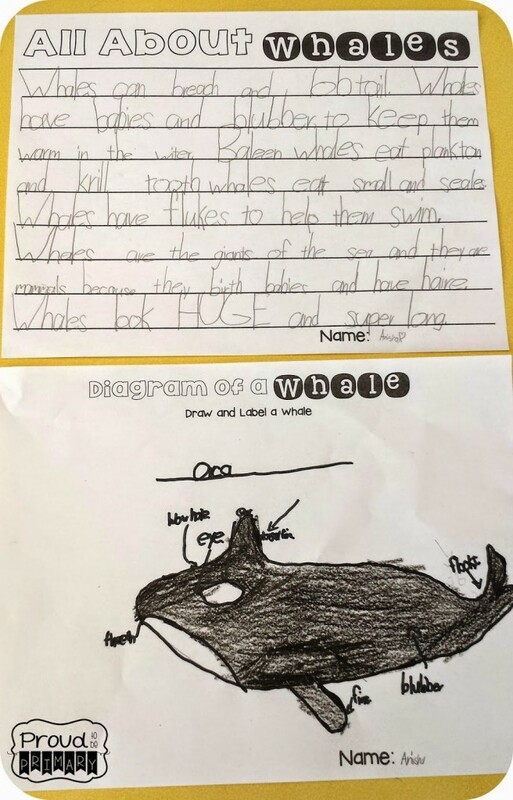 Another reason why I love teaching about whales is I find that kids do not usually have a lot of prior knowledge about them. This builds the excitement to learn about whales even more. We share what we wonder about whales and come up with “deep thinking” questions with a partner. I always let kids write their questions on sticky notes. I think this gets them more excited about doing it. They share their “wonders” and we add them onto a poster. I have the kids record their prior knowledge and questions on the KWL sheet. 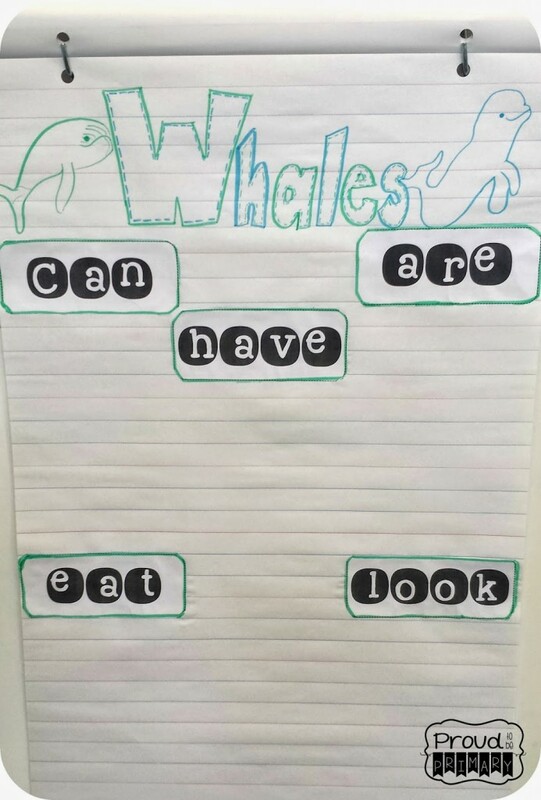 I use a large anchor chart with the labels “can, have, are, eat, look” to record facts as we read from some different whales books over the next few days.I use a chart like the one below to keep all of our new learning organized and attainable. Later, we use this useful chart to help us with our whale non-fiction writing. 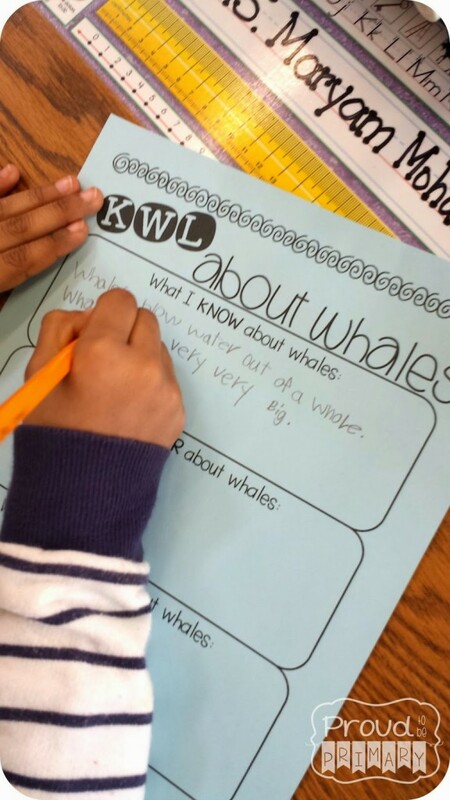 As a review activity, I have my students do a cut and paste of whale facts. 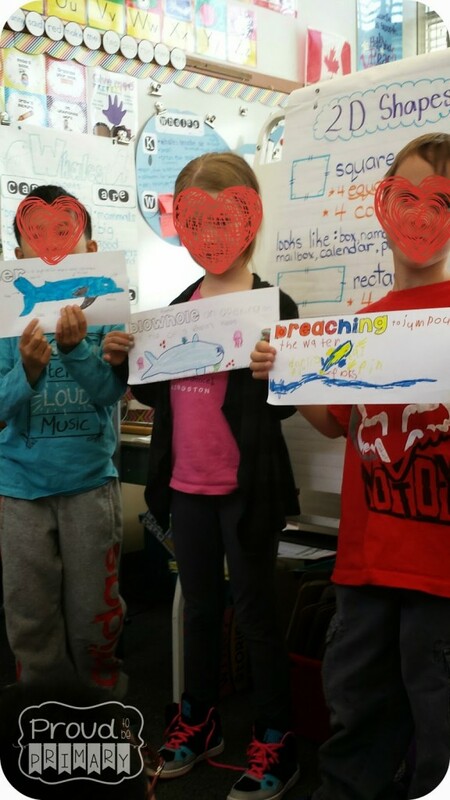 In pairs, they have to decide which category to put each whale fact under. 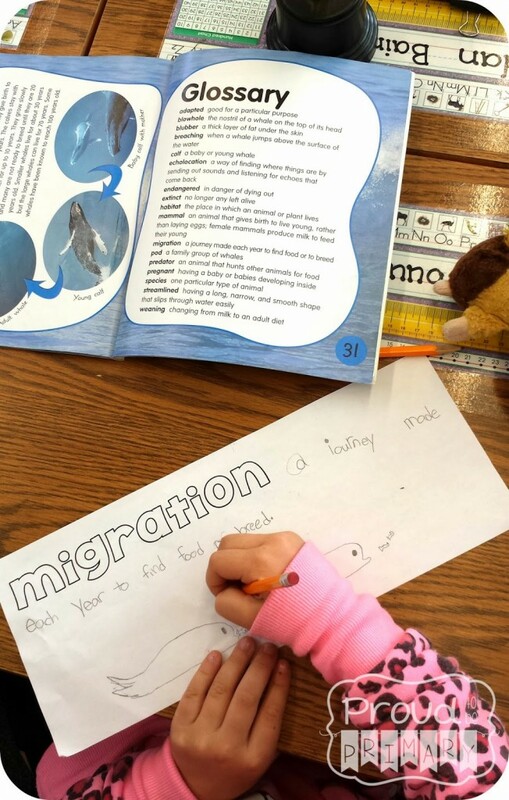 This activity is a great follow-up activity as it provides great practice for students and acts as an assessment for me to see who understands their whale facts. 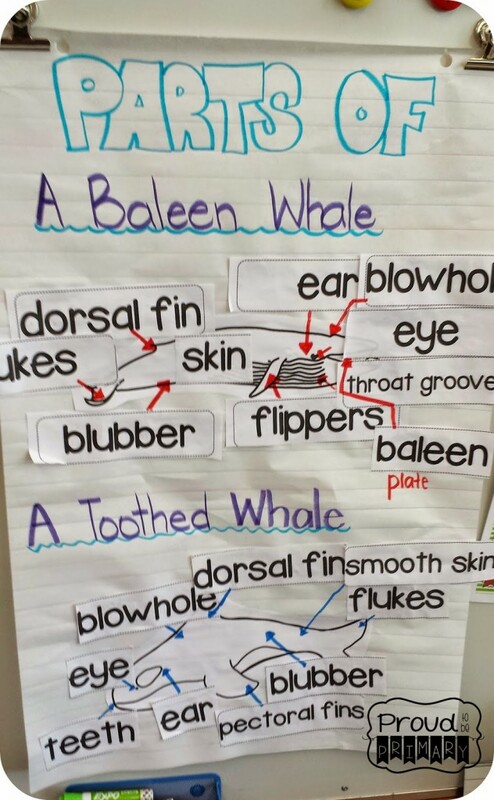 Another important lesson for the kiddos to learn is about the parts of a baleen whale and a toothed whale. They are different and it’s important that any study about whales teaches these difference. For example, their size, parts, how they eat, etc. We make a large anchor chart with pictures of each type and added on the labels. 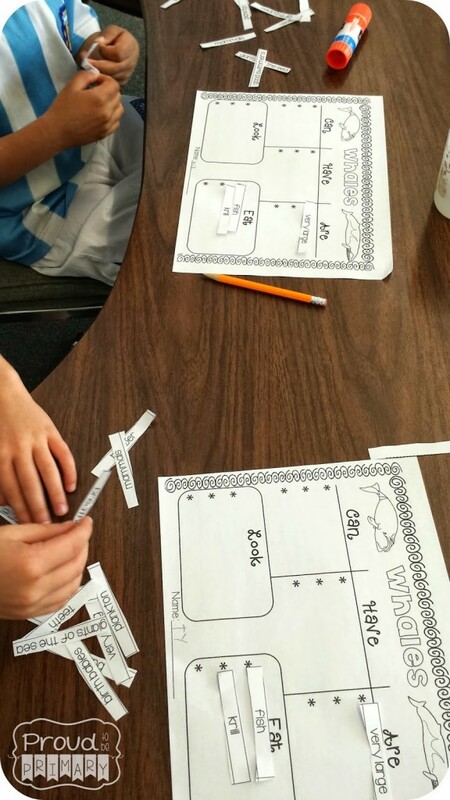 After, they do their own cut and paste activity to practice labeling the parts of whales. I always want my students to learn and understand new vocabulary with each new theme we undertake. 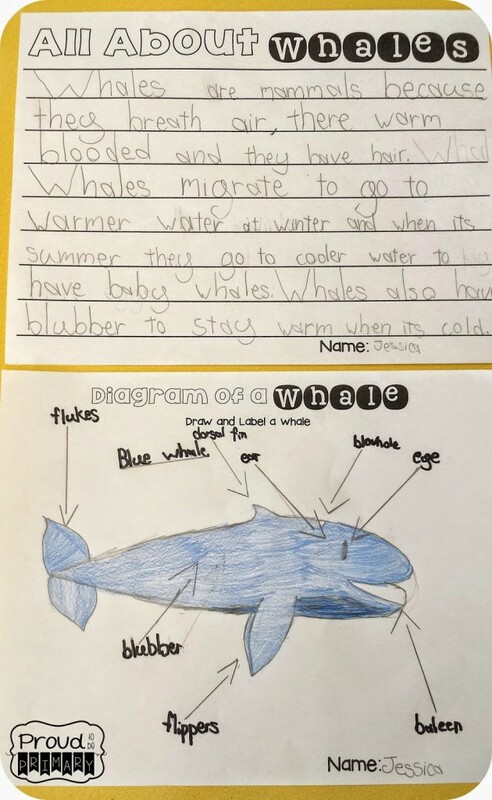 For our study about whales, I give small groups of students a few different theme words to study. They each have a non-fiction book about whales and I ask them to use the glossary at the back of the book to help them. Illustrate meaning of their word. 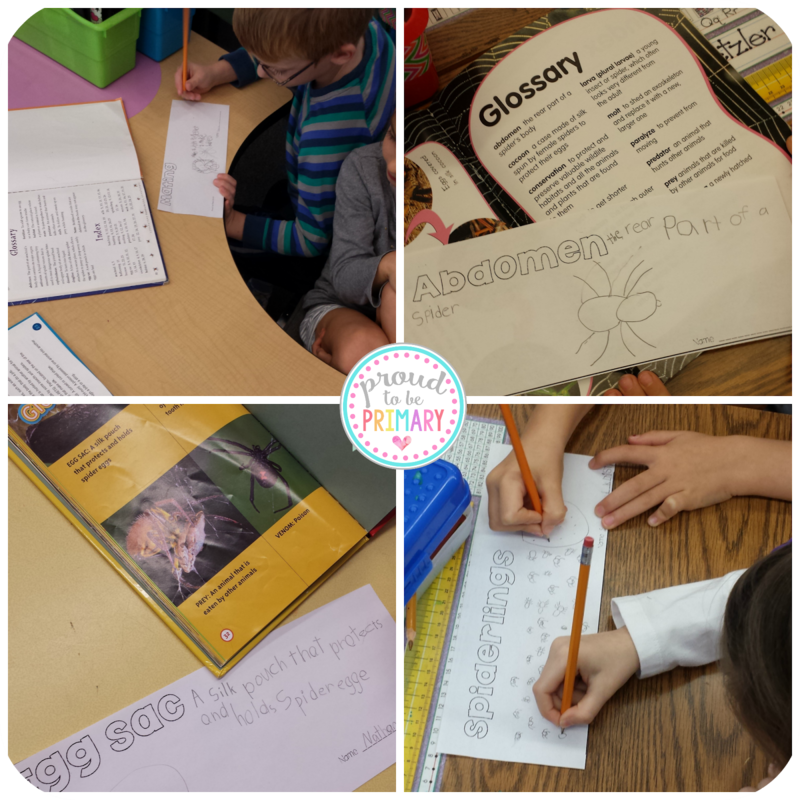 We previously learn about non-fiction text features so that my students know what a glossary is and why people used them. 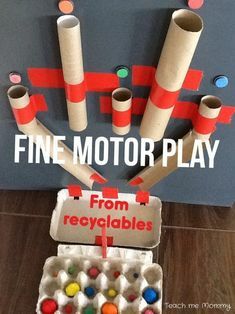 Students love this activity. They are engaged and working the whole time. They do a great job at clearly illustrating each word. 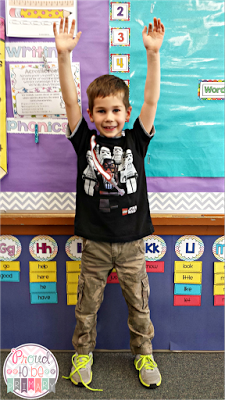 When it comes time to teach the class, they are ready and willing with their theme words. Using this method, the whole class learns about more than their own new word. 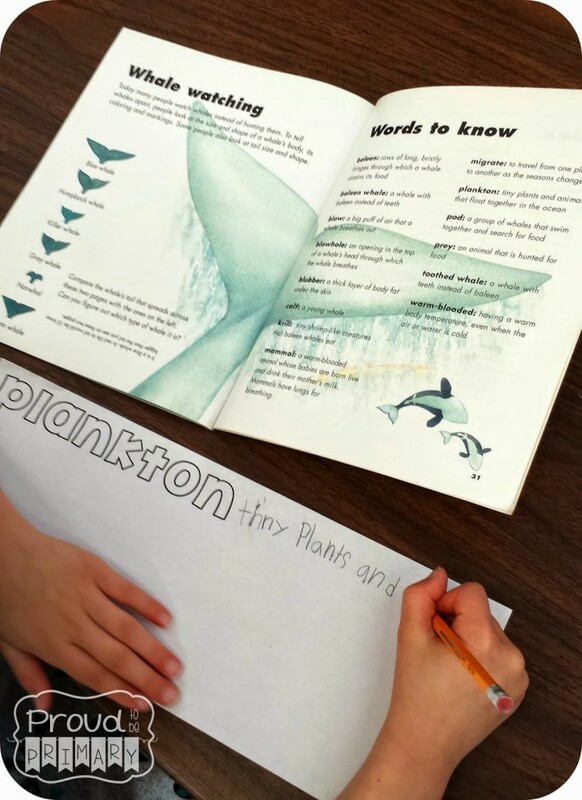 They learn the meanings of many new whale words they never knew before. 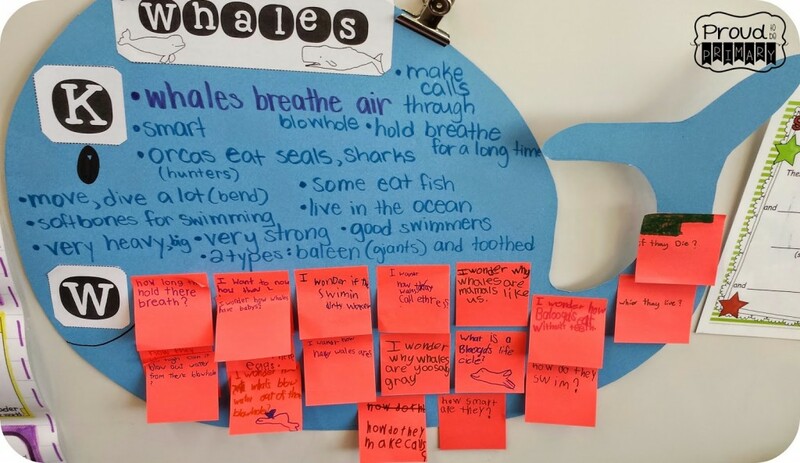 As a culminating activity at the end of our whale unit, I ask my class to write a non-fiction story about whales. They are allowed to write whatever they have learned. They can also use the information from the anchor charts posted around the room. I used this as my assessment piece. 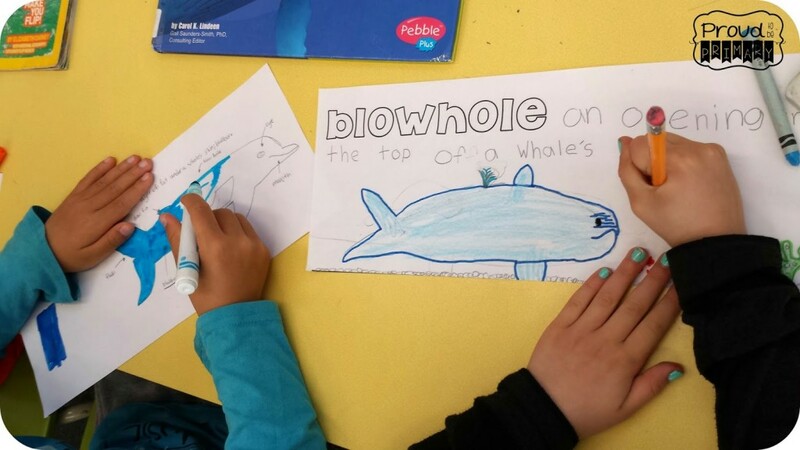 They are also asked to illustrate one type of whale of their choosing and to label it using a ruler. It’s a wonderful feeling at the end of any unit to witness the products of my students’ learning! As a fun art activity, I do a directed drawing of a beluga whale. My students get to practice on a piece of scrap paper first. 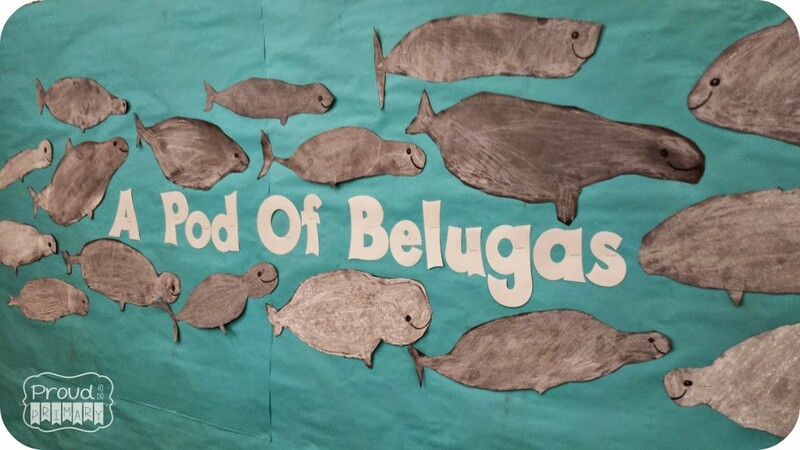 Then we draw the beluga again on a large piece of black construction paper. They use white chalk pastels to colour in the belugas and smudge the pastel with their fingers. Last, they cut them out and add an eye and a mouth with black pastel. Are they not simply adorable? 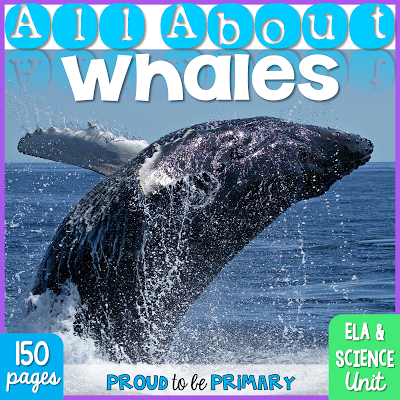 These activities are seen above, plus many more come from my All About Whales ELA & Science Pack (common core aligned). 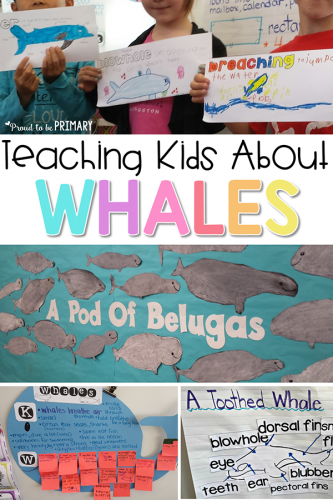 Have you taught about whales for kids before? 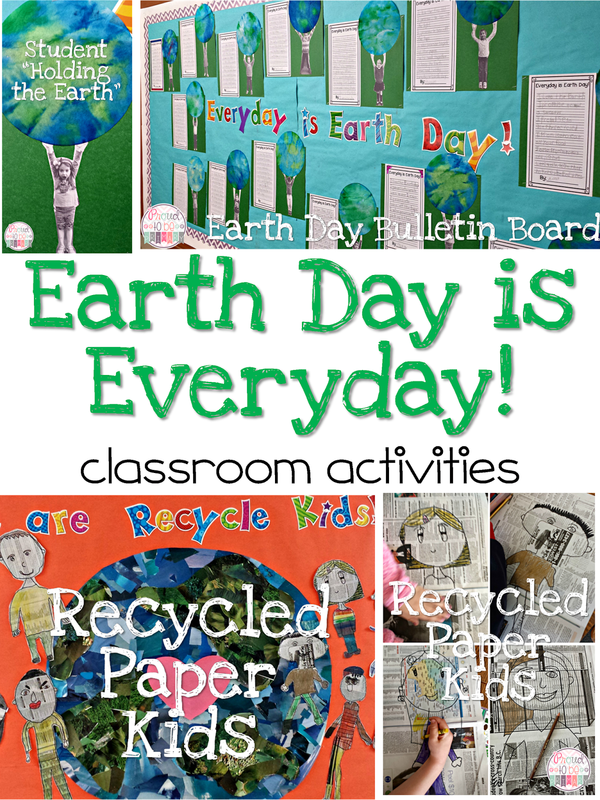 Teach children about keeping the Earth clean with these engaging Earth Day ideas. 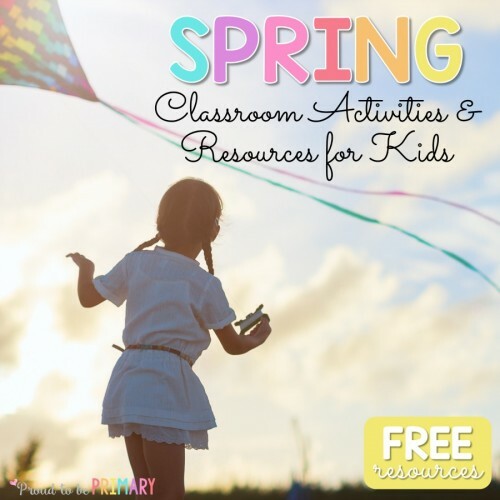 Includes a free writing and art activity and book suggestions. 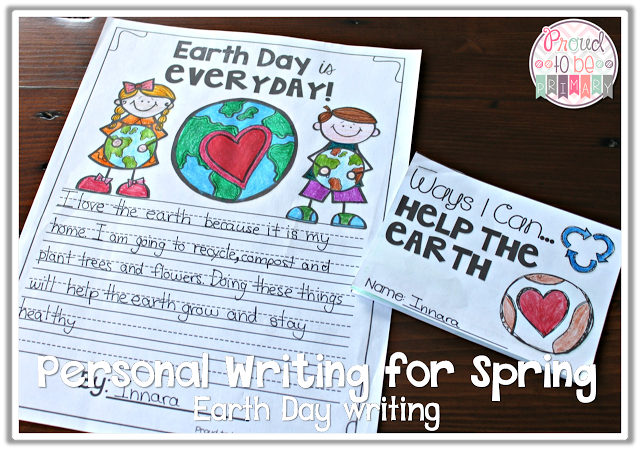 This post includes wonderful Earth Day ideas and ways to teach children about caring for the Earth. Every year I teach my students that they can make a difference in the world. Even with the small things that they can do everyday. I believe that educating our children and students about the importance of caring for our Earth is extremely important in the world today. The children of today are the ones who will make a real difference in how the Earth continues to evolve in the future. 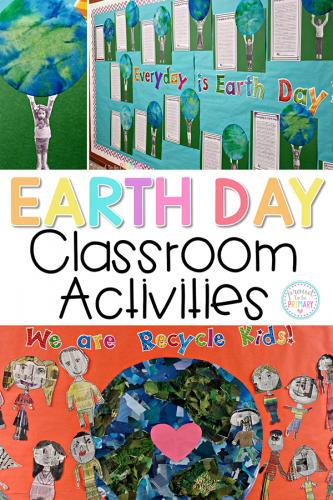 In my classroom, I spend the 2 weeks prior to Earth Day (April 22nd) teaching my students about the ways they can care for the earth and completing Earth Day ideas. We discuss the things they can do in their classroom, at home, and on the playground. 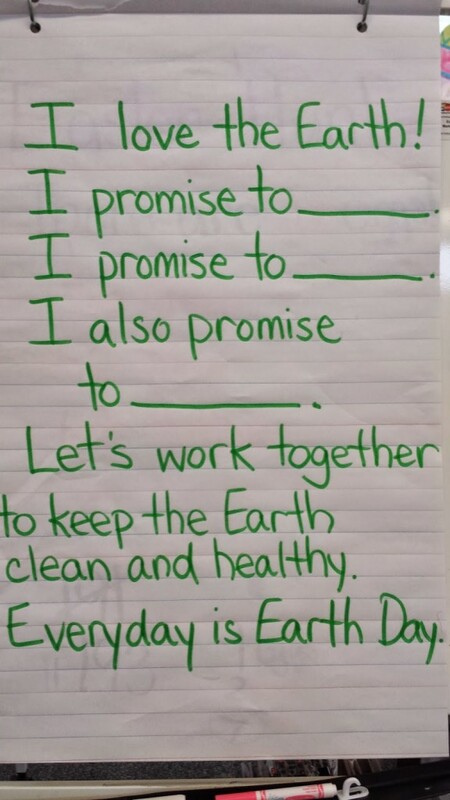 It’s fun to brainstorm ideas and have great discussions on ways we can keep the classroom and playground clean, save energy and, do our part to keep the Earth green and beautiful. 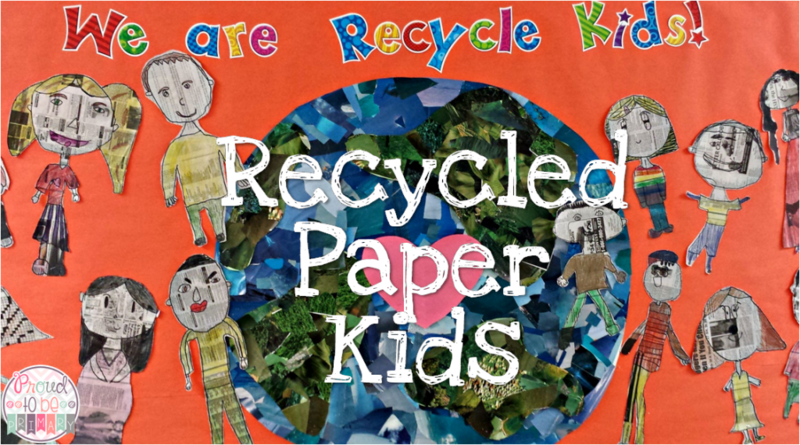 We practice reusing items instead of throwing them away and we recycle our containers and paper when we finish with it every day. Also, we reduce how much energy we spend by turning off our classroom lights and we go outside to pick up trash left out on the playground. 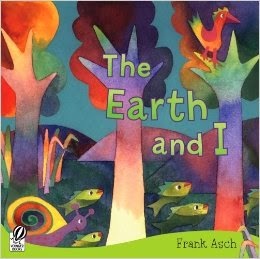 The Earth & I by Asch. 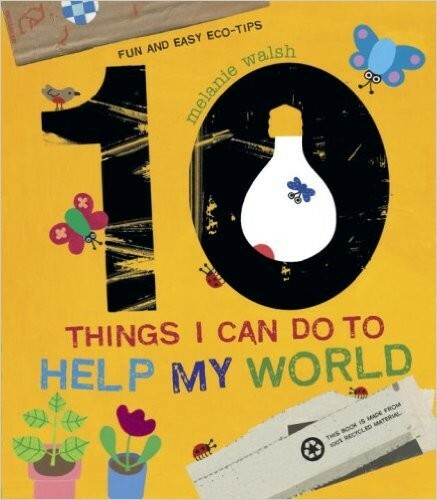 These books really give kids some great, simple ideas of things they can do to help everyday! 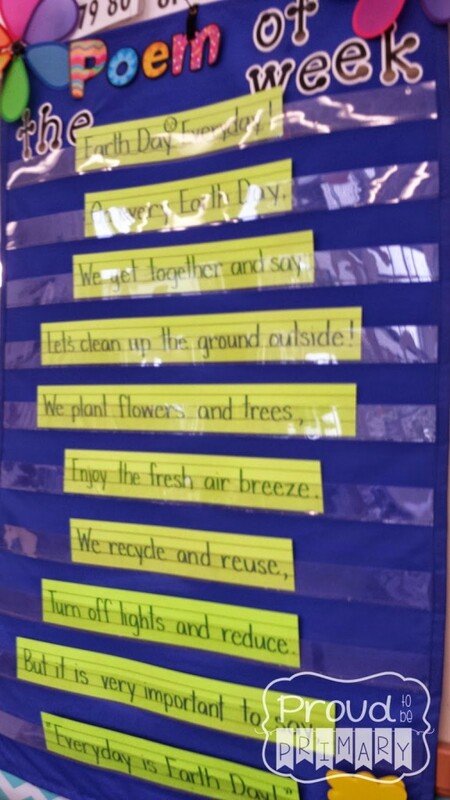 We read a poem of the week called “Earth Day Everyday!”, and we complete our follow-up poetry activities. 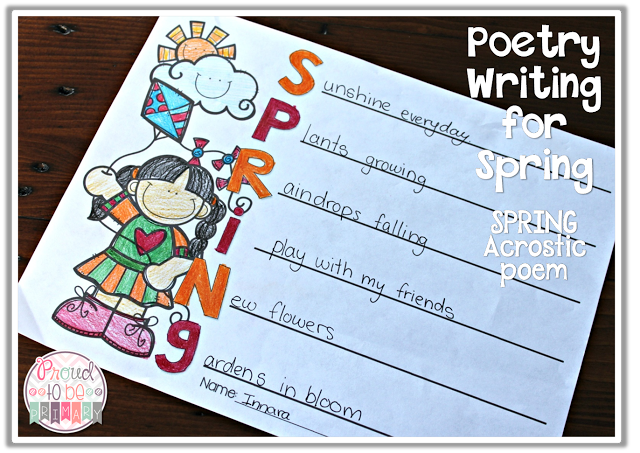 This poem and activities plus many more are available here. 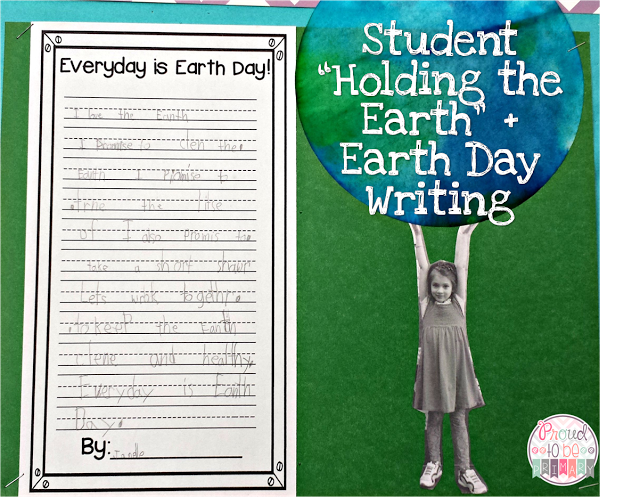 We write about why everyday should be Earth Day using the ideas we have brainstormed about on a chart. I give my students a template that they may wish to follow for ideas. 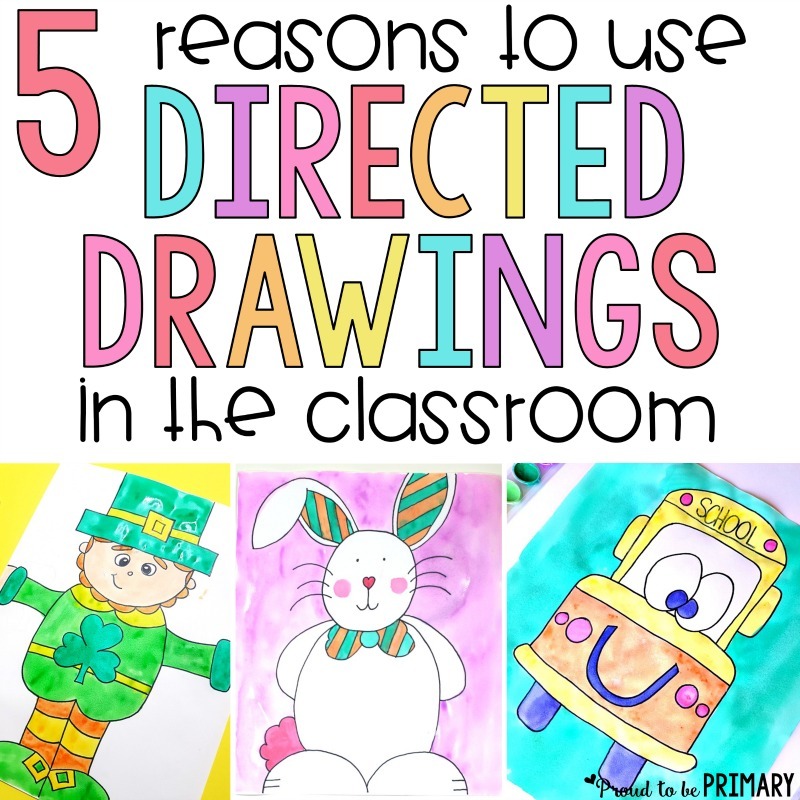 With any classroom unit or theme, I love to incorporate art as way of illustrating our learning. For the student “Holding the Earth” art activity, I start by taking a photo of each student pretending to hold a ball over their heads. I print them out in black and white off the computer. 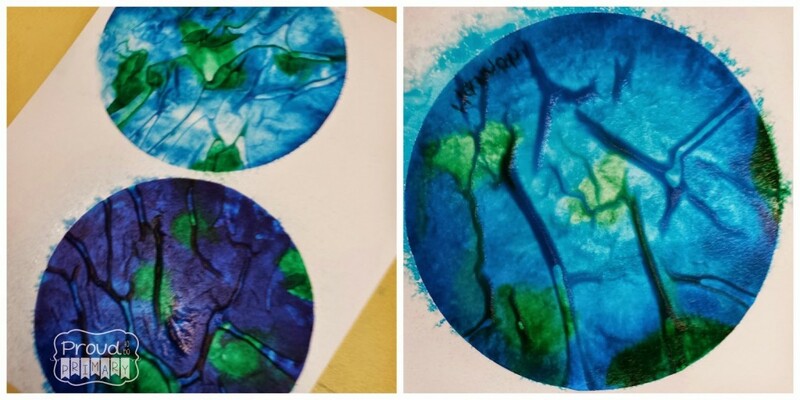 We each colour a coffee filter with green and blue markers to look like the earth. We spray the filters with water and let them dry. Lastly, we assemble and glue our writing, photos and earth onto green tag. 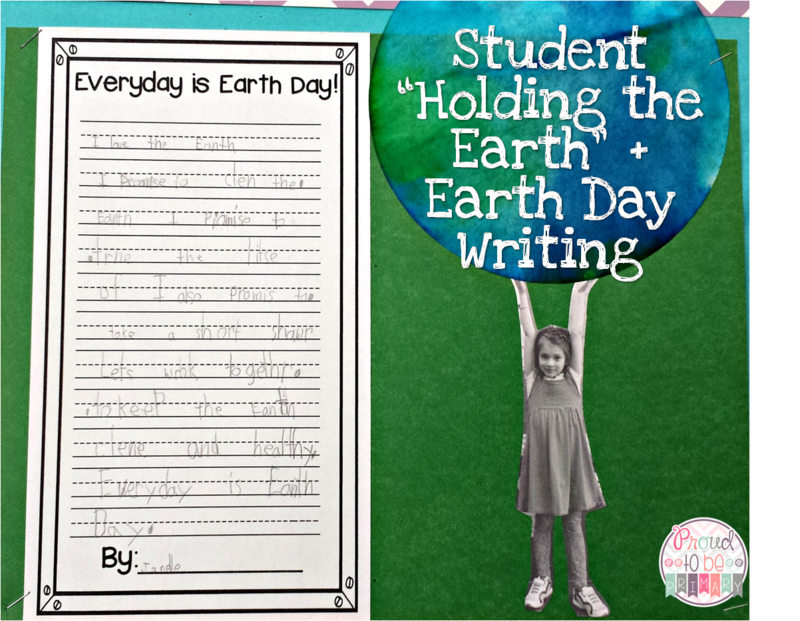 We include our “Everyday is Earth Day!” writing together with our photo and our water sprayed Earth to create a nice display. We post each of the displays together on a bulletin board. This is my favourite bulletin board of the year. We have the parents in to show off our writing and how cute their children look holding up the earth! 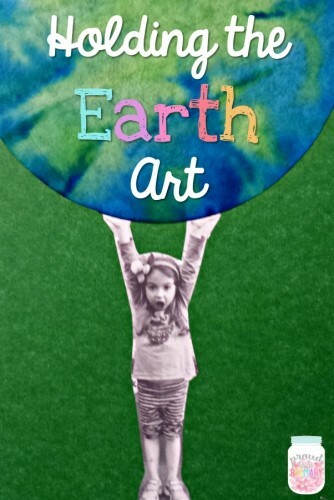 Click HERE for Teacher Idea Factory’s kid holding the earth idea & HERE for Teacher Time 123’s coffee filter idea. 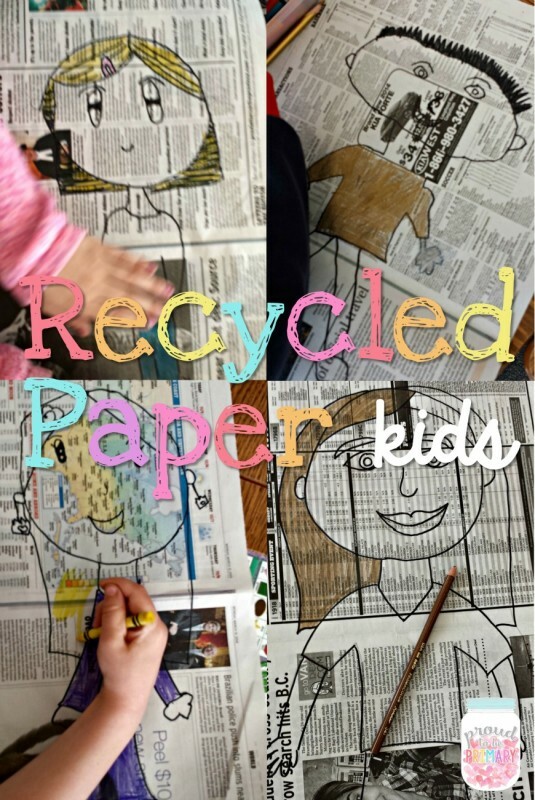 We also make “Recycle Kids” self-portraits on newspaper. First, we start by drawing a self-portrait with pencil. We then use sharpies to trace the lines. Next, we color our clothes and hair (not skin). We glue onto white tag for durability and cut out.It was an interesting activity because my students had never reused newspaper this way before. They said it seemed strange to have newspaper print as their skin color. This creates a meaningful result and a special bulletin board with an important message. 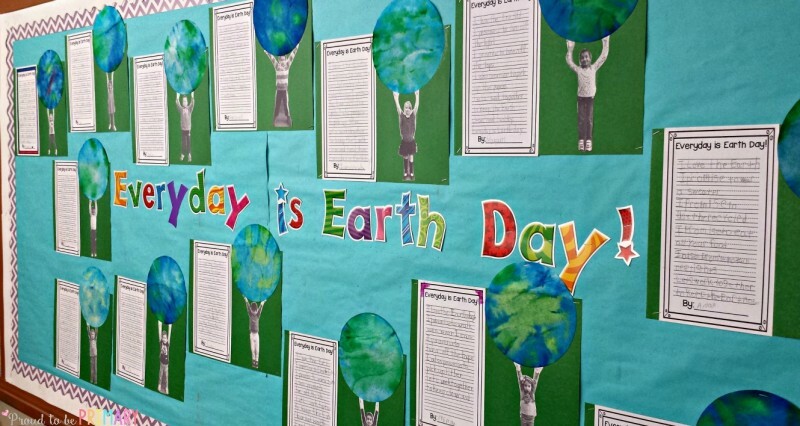 I also add a large earth my class made in a previous year by tearing out pieces of blue and green paper from old National Geographic magazines and gluing them down to look like the earth. What a great project of team work that was. I enjoy REUSING the Earth again each year! 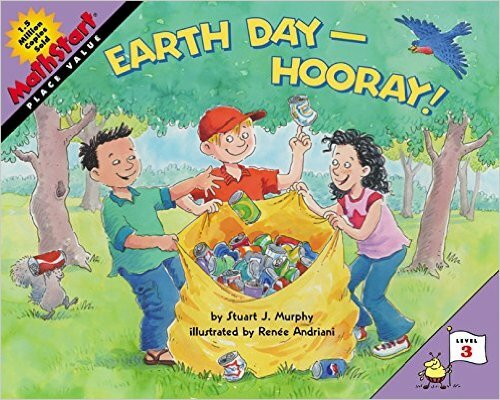 Earth day is a great day to remind yourself and your students about the importance of keeping our earth clean and healthy. I had a parent come and tell me today that her daughter no longer wants to have baths, but “quick showers that save water!” It makes everything we do to teach our students worth it when it changes an attitude or behavior for the better. 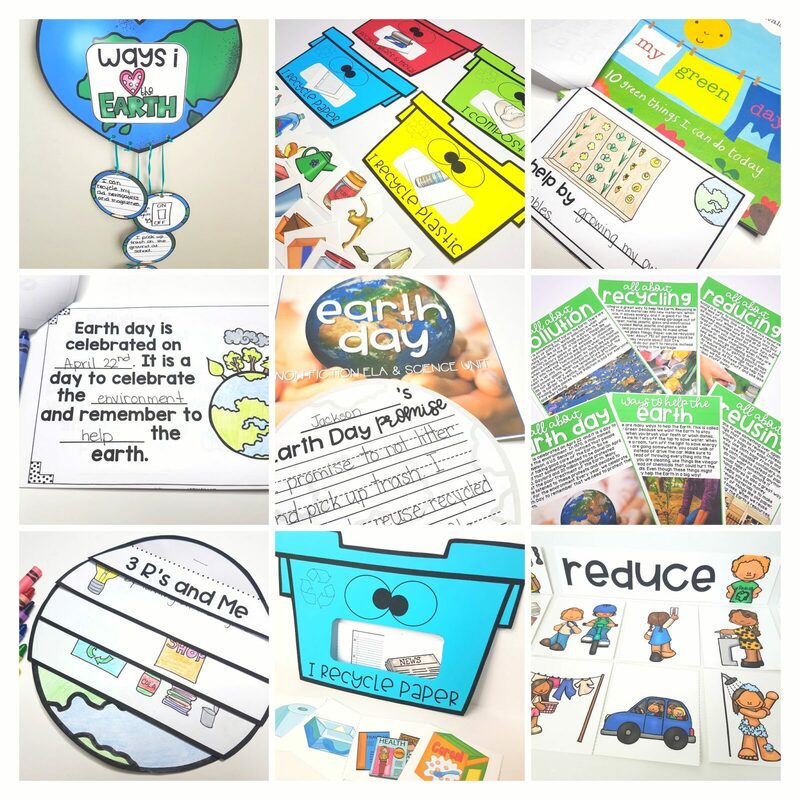 If you are looking for Earth day ideas, this comprehensive Earth Day unit includes writing, reading, science, and more hands-on learning activities. Click HERE to see it in store. I would love to hear how did you teach your students about Earth day? Hi everyone! 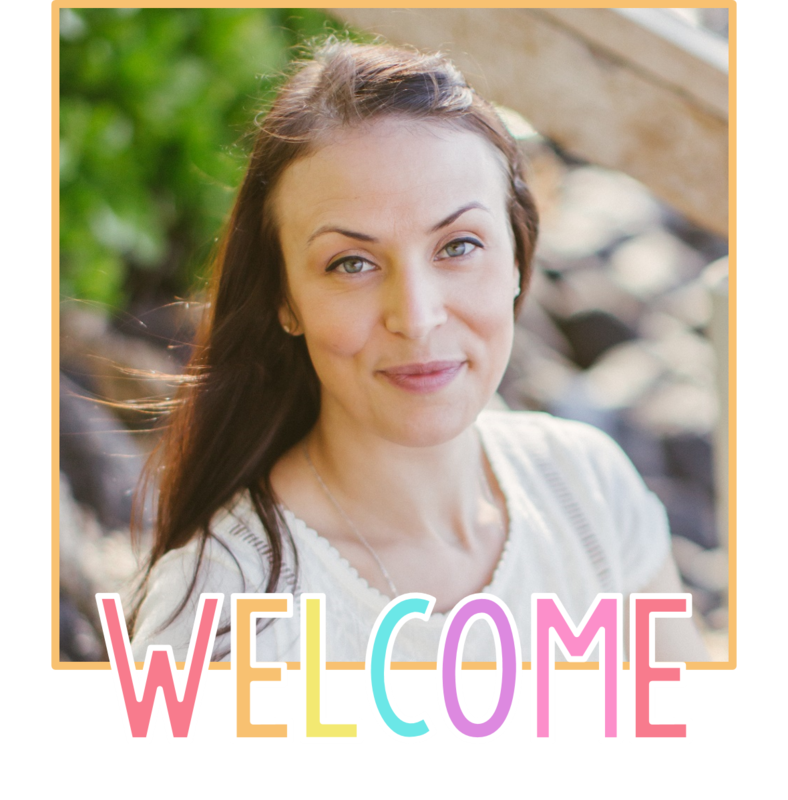 Welcome to Trade & Grade facebook group Blog Hop! 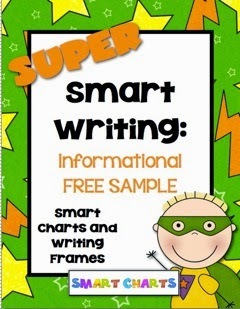 I’m super excited today to talk about Jayne Gammon from Smart Kid’s Super Smart Informational Writing Pack. After looking through the pack, I knew that I would be able to use a lot of the writing options in my first grade classroom. 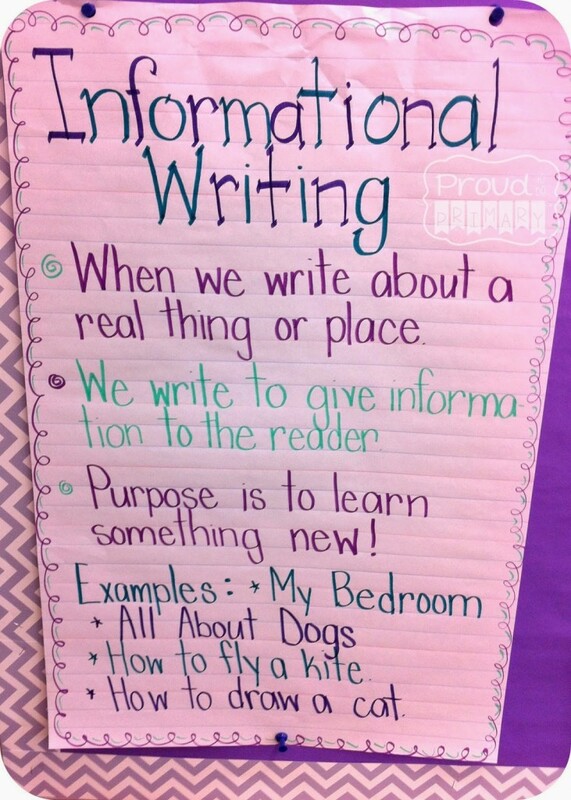 First I needed to teach my students about informational writing. I made this anchor chart to introduce the lesson and have a discussion. 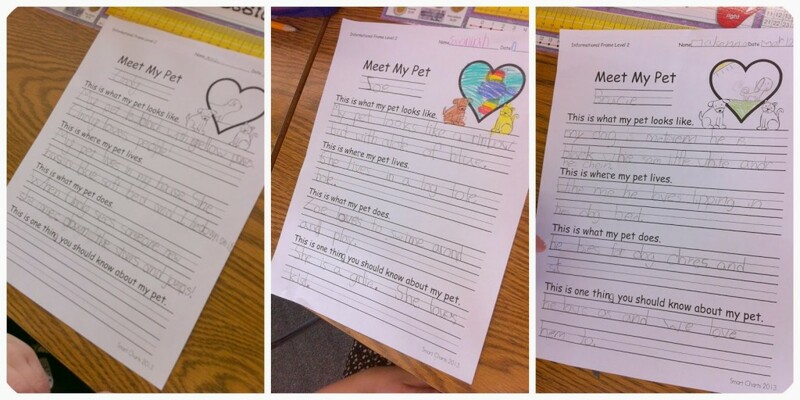 We talked about writing to give the reader information, to learn something new and came up with some examples that children could connect to. 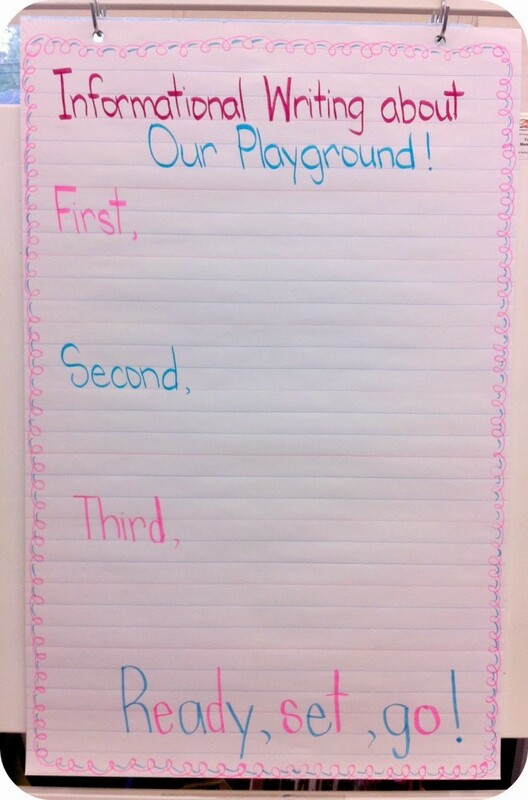 Then I prepared a brace chart of one of the templates included to write about “Our Playground,” one of the writing choices in this great pack. I left the chart blank and my students and I went through it together coming up with ideas and writing the information piece together. This particular chart is divided sequentially into first, second, third, which my students and I felt helped use organize our thinking. 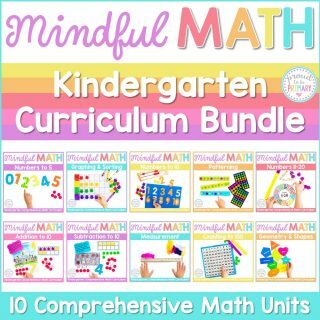 This pack has many different types of charts and writing frames so students can become familiar with and practice using different templates. 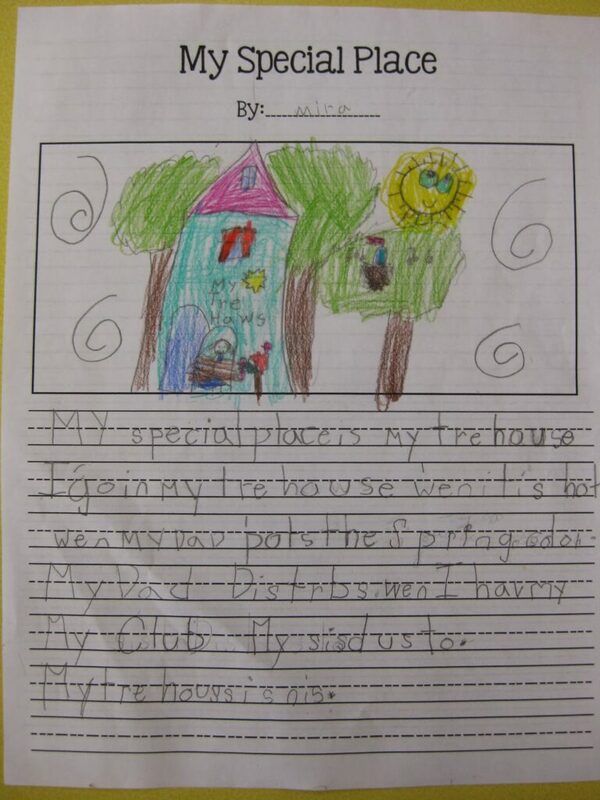 We have completed lots of writing before now and my students are able to write independently. 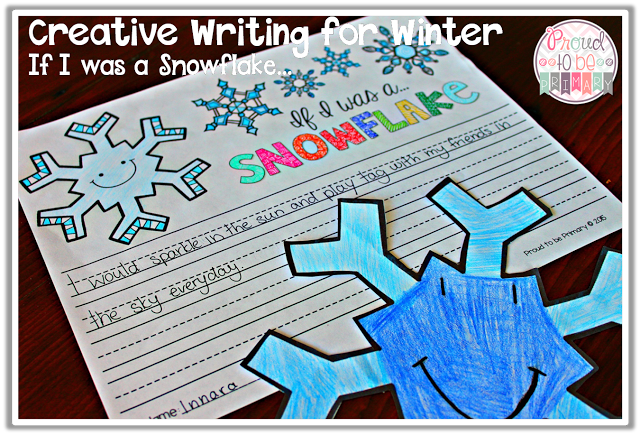 We have done a few how-to writing pieces before so I felt confident these activities would be a nice follow-up activity. I decided to use the level 2 writing templates with my students. In Jayne’s pack there are three levels of writing templates to make it easy for you to differentiate for your students. 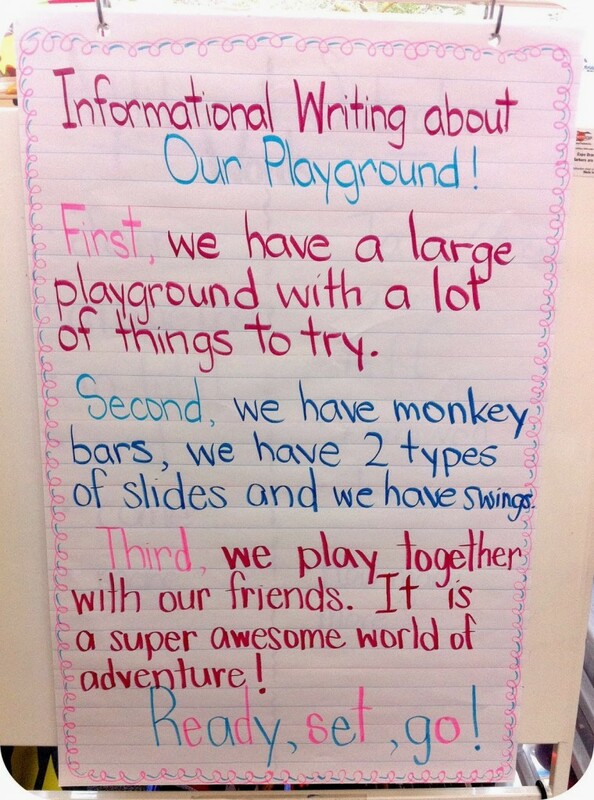 After we wrote the playground piece together, I decided to give my students a choice of 4 of the informational writing templates out of the 8 included. 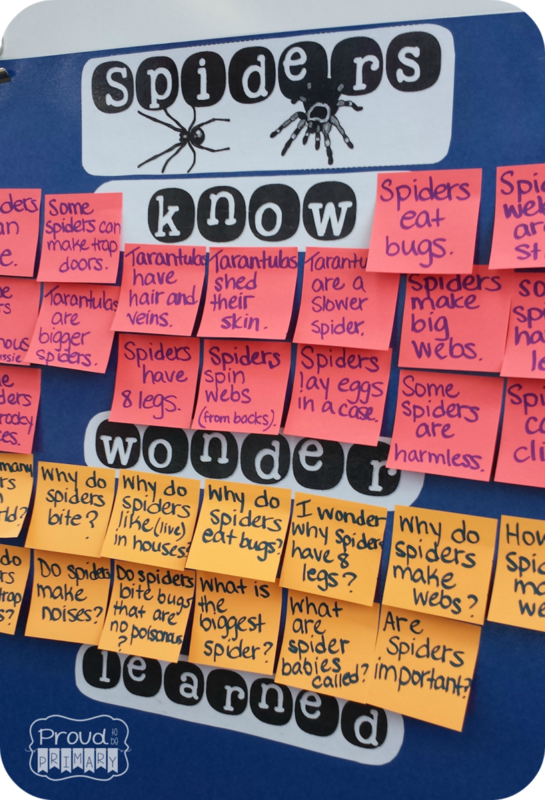 I choose the topics that I thought my students would connect to best (all of the writing topics included are topics kids can relate to!). We talked about how it is best to choose a topic that you can relate to and know enough information about. 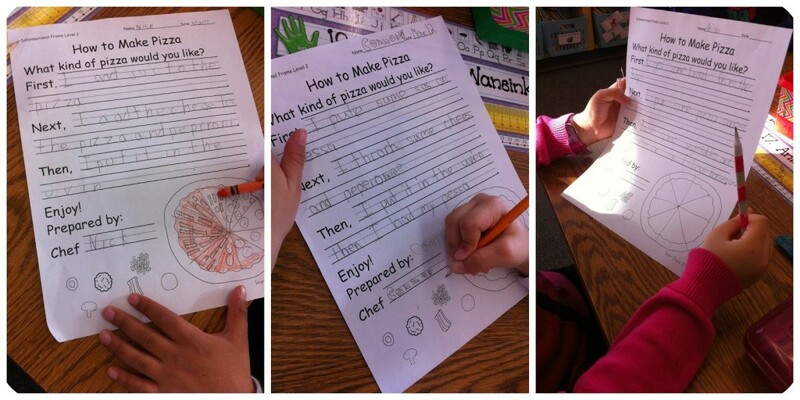 The choices given were how to make a pizza, my pet, directions to my house and introducing my teacher. They quickly choose their topics, took their template back to their desks and got started. My students got to work so quickly and quietly that I knew they were engaged! 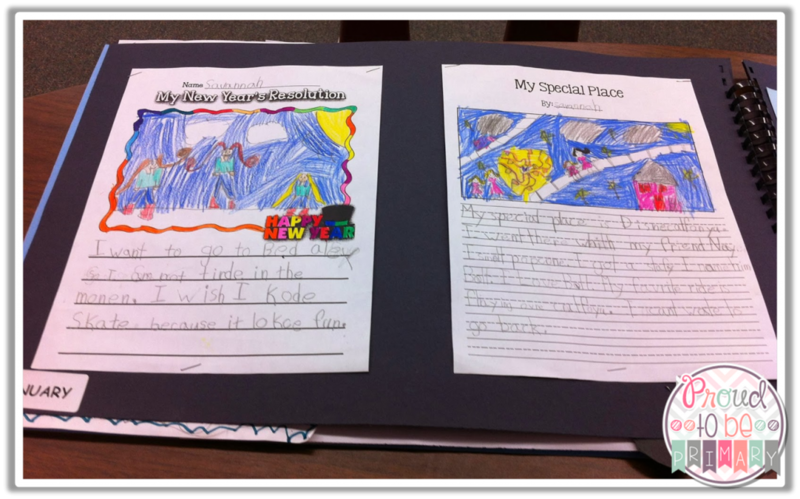 They felt confident to write about their chosen topic independently because the templates are clear and easy to follow. My students loved that there was a place to draw and something to color to go along with their writing. 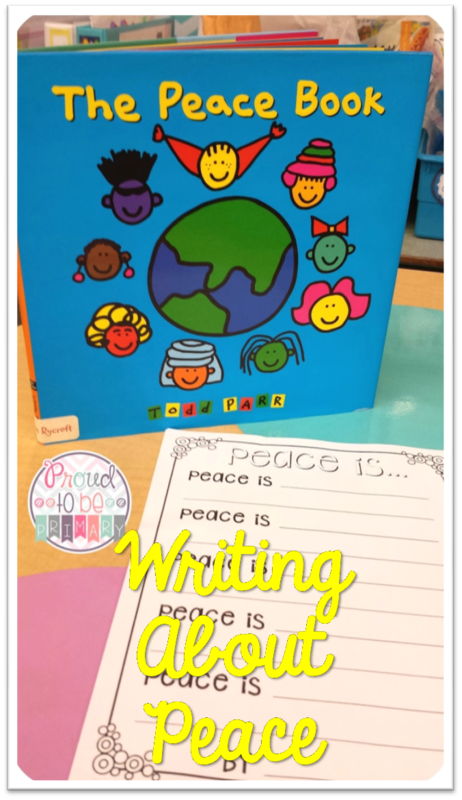 This writing activity was a complete success and my students enjoyed the experience! 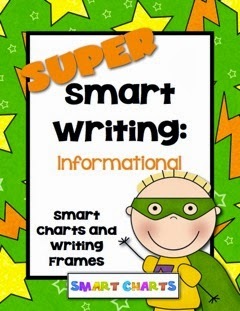 I highly recommend Smart Chart’s Smart Writing Informational pack. 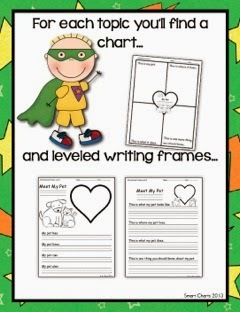 For each topic you will find a chart and leveled writing frames to make differentiation easy! It comes with some cute notebook dividers that could also be used as booklet covers if you wanted to make a book with many of the writing frames. 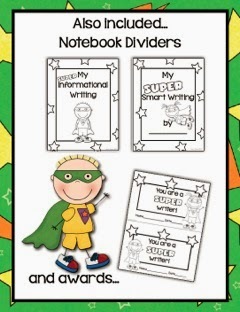 There are also “super writer” awards to give the students after they complete their writing! 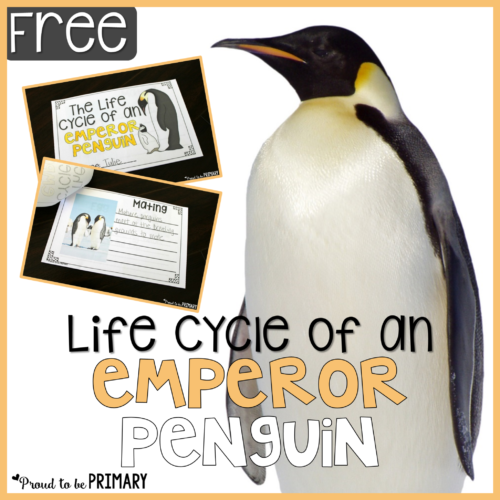 Jayne has put together a great freebie for you all to have as a sample. Click the image below! Don’t forget to leave her some love if you use!! 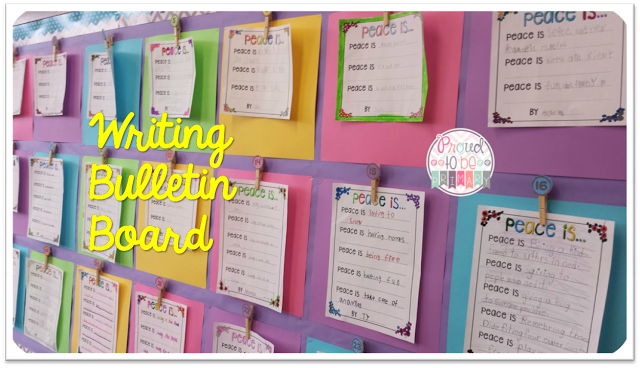 If you love what you see, you must also check out Jayne’s other smart writing packs on narratives, opinions and persuasive. Click the link below to view her bundled pack! Click her button below to visit her blog and read all about Jayne’s review of my pre-primer sight work pack!! The school district that I teach in uses student-led conferences as a way of show-casing student work and achievement with families. Our students get to present their work, their learning and their classrooms to their families. It is run by students after a week of practicing and prepping for the big day. We spend a lot of time preparing student portfolios for student-led conferences. It takes a lot of preparation ahead of time by the teacher. I love spending the time to get things ready because it gives me the opportunity to reflect on how far each of my students has come during the year. 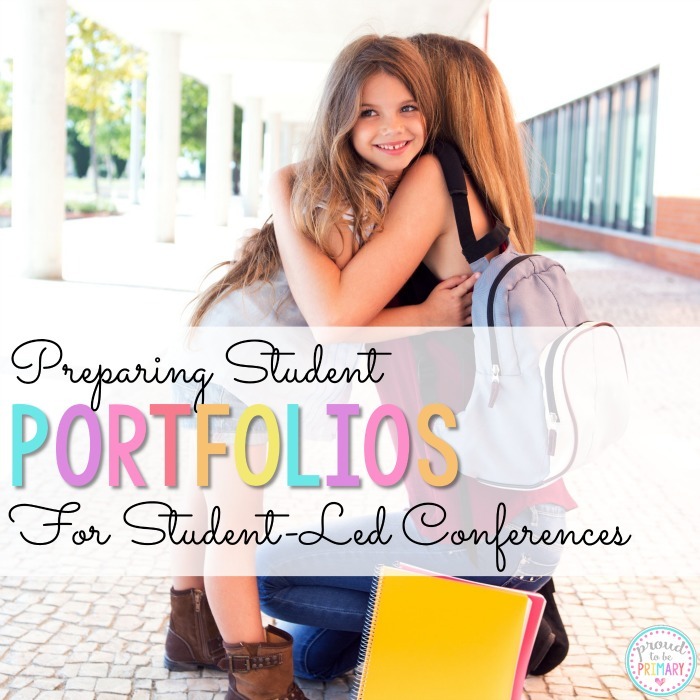 This post guided you through creating portfolios, setting them up, and preparing for student-led conferences. 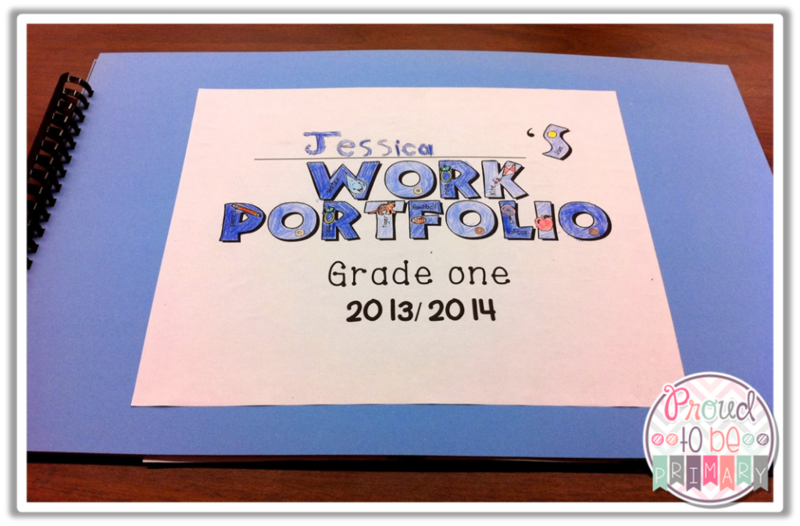 My favourite way to display student work is in a work portfolio. 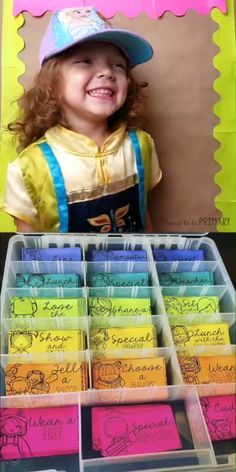 I prepare these at the beginning of the year and add to them throughout the year so they are ready to go for the conferences. 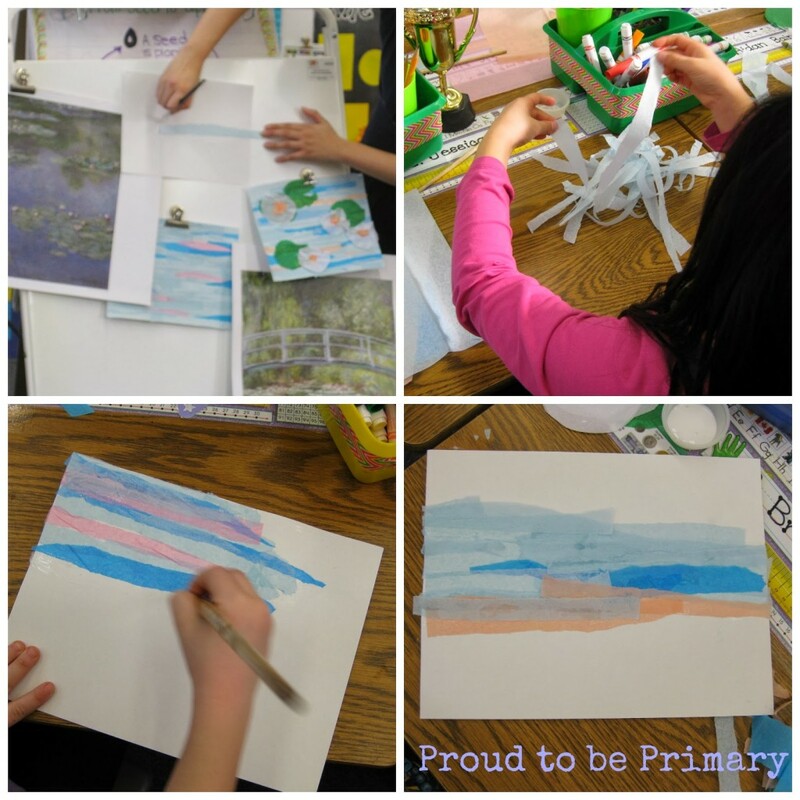 I select and put aside work pieces that the kiddos worked especially hard on, as well as a few great pieces of artwork. I keep their samples set-aside by month and later file them in a tub that is separated by name. Before conference time, I put together their portfolios by stapling and gluing in their work samples. I also made this cute cover page for them to write their names (in fancy writing or block letters) and to color before I glued them on the cover. 1. I cut a large piece of bristol board in half to make a front and back (each piece should be 14″ x 22″). 2. I cut large pieces of construction paper into 13″ x 21″ pieces. I like to have 2 pieces of paper for each month of the school year (20 pieces of paper). I like to use black paper because it makes for a nice backdrop, but you could use any colors. 3. I bind them together with a ring. If you do not have a binding machine, you could staple it together with a heavy duty stapler. 4. You are now ready to add student work! Once it’s been bound together, it is easy to open and flip to the next page. There is room for 1 or 2 things on each large page. I insert items by month into the portfolios so that families can see the growth through the year. 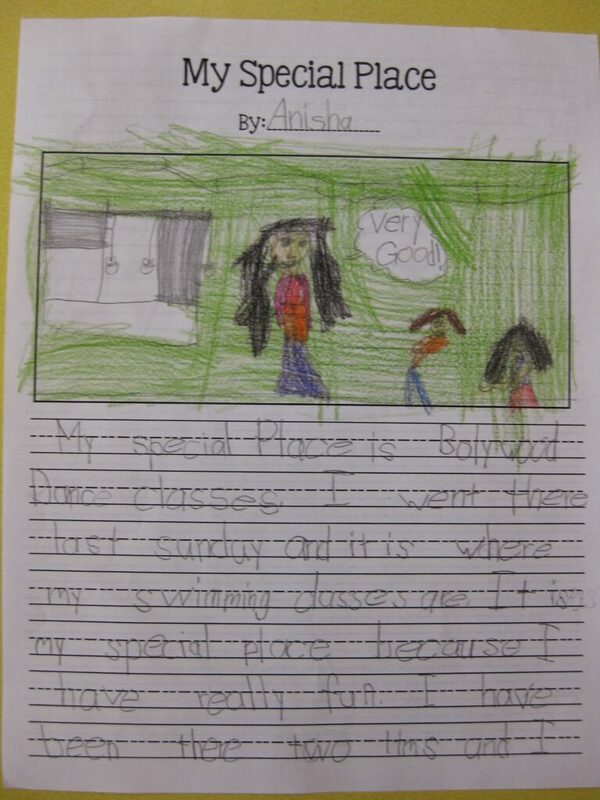 They can see how much their child has learned and how far they have come with their writing, drawing, artwork, etc. I like to put a label with the month in the corner of the page as a guide to the viewer. 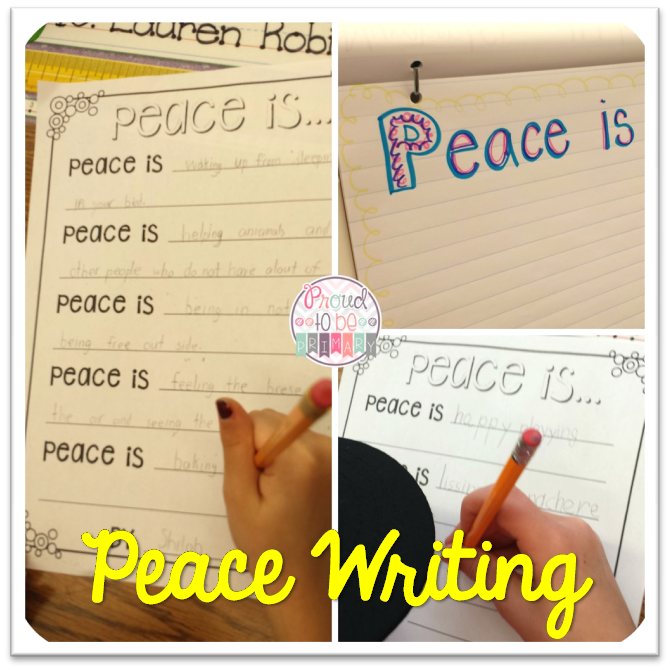 I have created this simple writing paper for my students to use and they always turn out great. 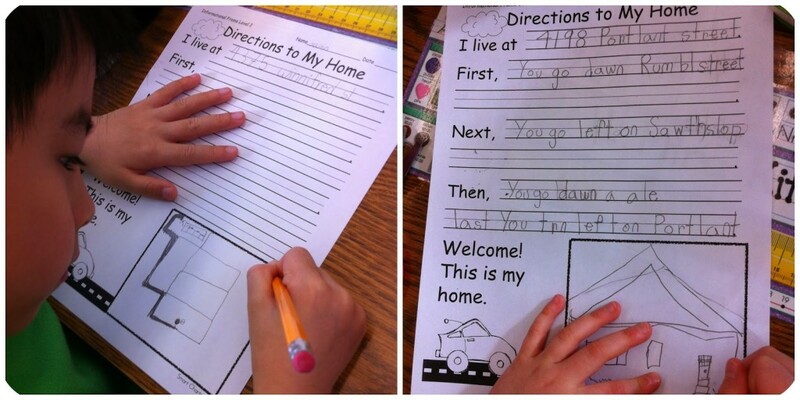 I will also add a photograph of them at school to go next to their writing. The week of the conferences is focused on preparations. We practice and prepare what our families will see. 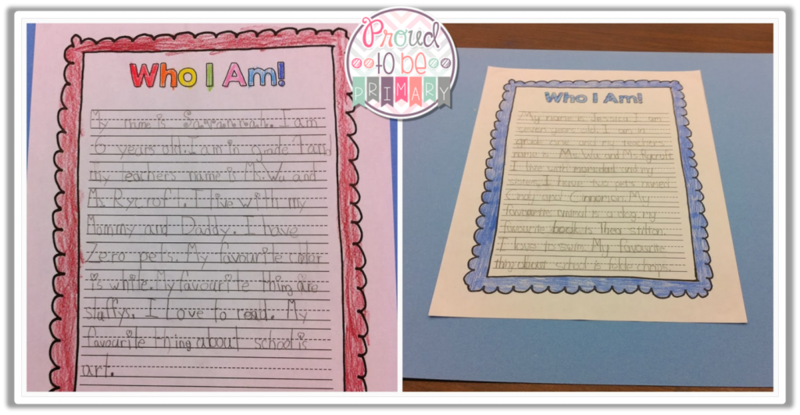 We complete a reflection and goal sheet and a student-self assessment. Before completing our reflection, we prepare by brainstorming about what we have learned so far this year. This is usually surprisingly hard for them as young children live in the NOW and often forget what they’ve already done. Reminders are necessary! I wish for them to share things they are good at. I boast about how they have learned to READ and WRITE and ADD and SUBTRACT! I get them to share their favorite part of school. They also need to come up with a goal for the rest of the year. Finally, I request a “powerful” picture that will “WOW” our families that is neat with lots of details and careful coloring. We hang these up on our “WOW Work” board for families to see. 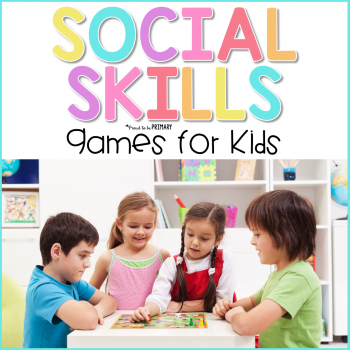 I have my students self-assess their work habits and social skills at school. I made a quick self-assessment with clear, easy to understand questions and cute simply faces that children can understand. We sit together at the carpet with a clipboard, pencil and eraser in hand. I explain that I need them to be honest about their answers and to think about themselves personally, but not too critically. I tell them it is okay to not get all smiley faces and that no one is perfect. That there are things that everyone works. We go one question at a time, reading the questions and coloring in the faces to show if they do something all the time, some of the time, or needs work. It’s nice to see how honest my students are about their strengths and areas to work on. It is important for my students to practice for their conferences. The conferences go smoothly when there is adequate time to review the expectations and have a pretend practice with a friend. 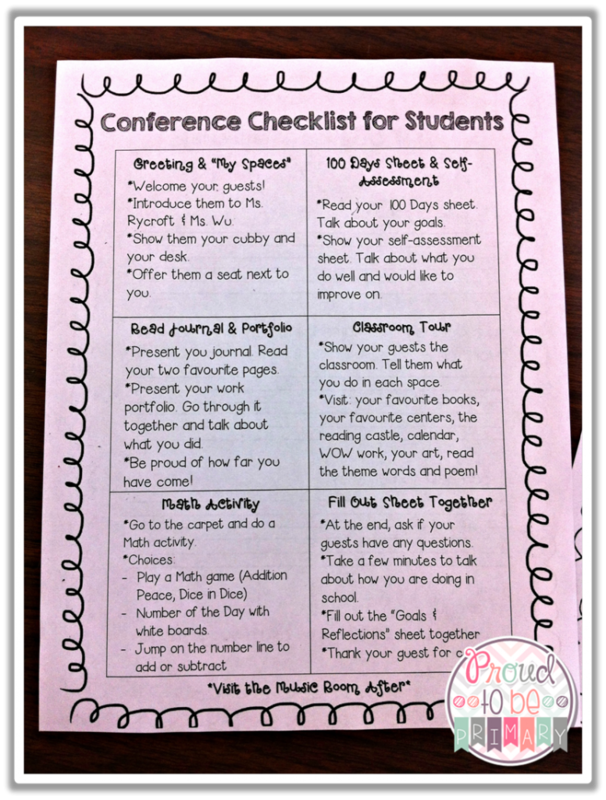 I start by giving my students a copy of the student-led conference checklist. We read each part together, stopping along the way for me to demonstrate what they need to do. 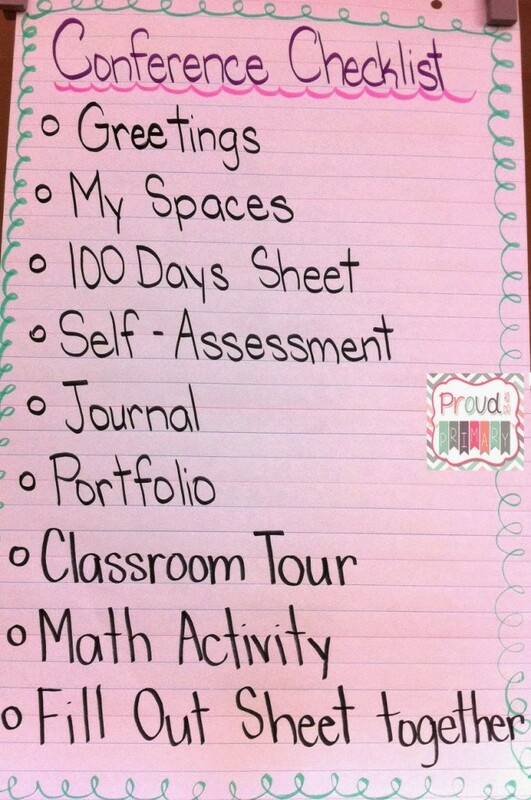 I have a large checklist hanging up on the wall for the kids to use as a guide during their practices. Students go to their desks and read through their portfolios and journals. They pick and practice a math skill they will show their families. 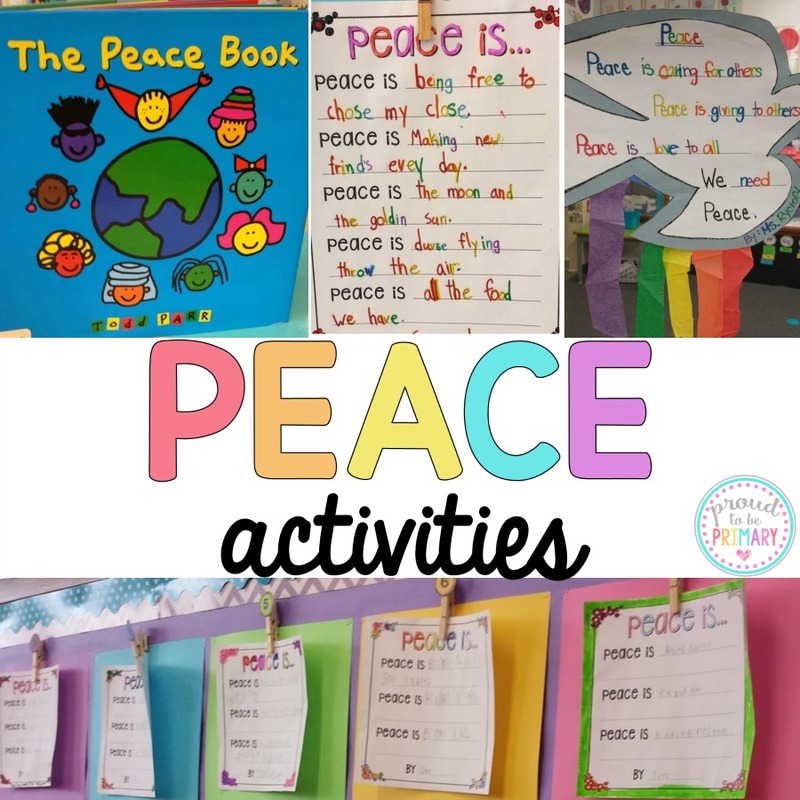 Some of the choices I give are an ‘addition peace’ card game, adding and subtraction on the human number line, number of the day activities on a white board, or playing a game with the ‘dice in dice’. I pair them up and they take turns going through the conference with a friend. They have so much fun pretending to be the other persons’ family member. After this, students are well prepared for the big day. On the day of the conferences, we do a thorough classroom clean-up of our desks, personal spaces, and the classroom. 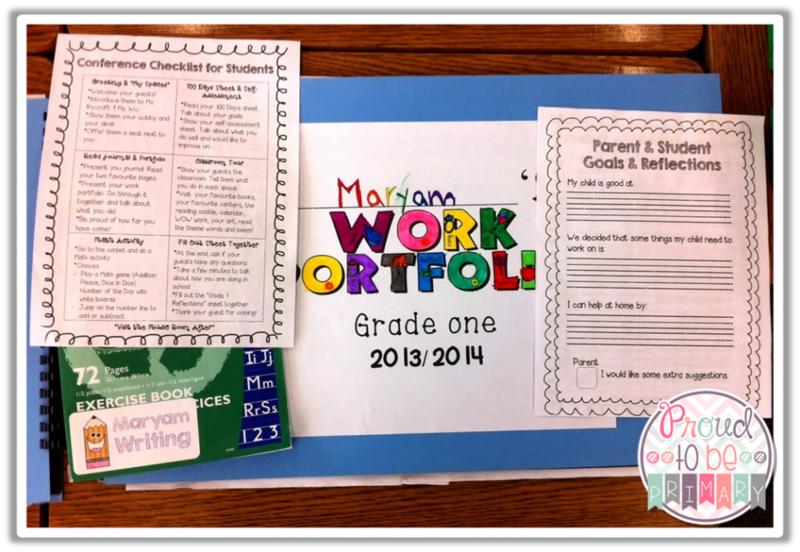 On their desks,they lay out their work portfolios, a conference checklist for parents and students, their journal, and a parent & student goal & reflection sheet. I request that parents fill out the reflection sheet with their child at the end of the conference. My favourite part of the conferences is watching my students greet their families and share their achievements with so much pride and confidence. Students feel successful and parents leave incredibly happy to see how far their child has come. If you are interested in grabbing ALL of the sheets I use for preparing student portfolios for student-led conferences for FREE, click the image BELOW. 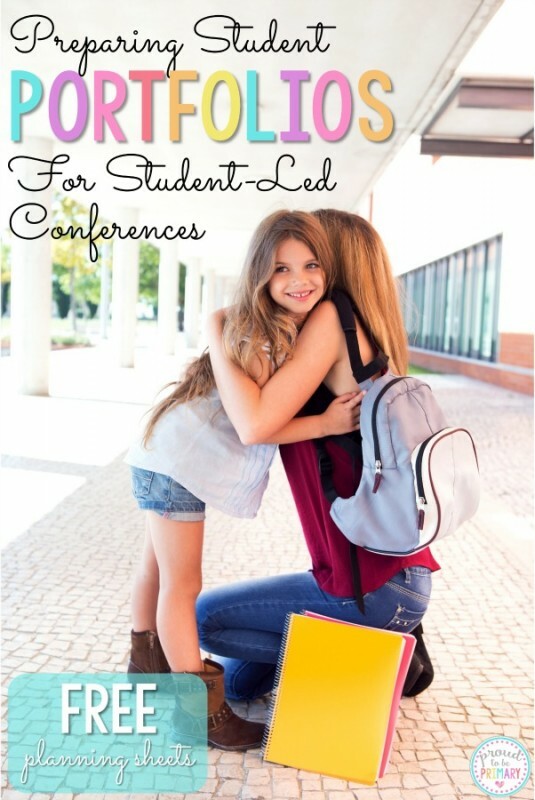 I hope that you have found this post useful in giving you some new ideas on student-led conferences. I would love to hear how you have students share their learning with their families. 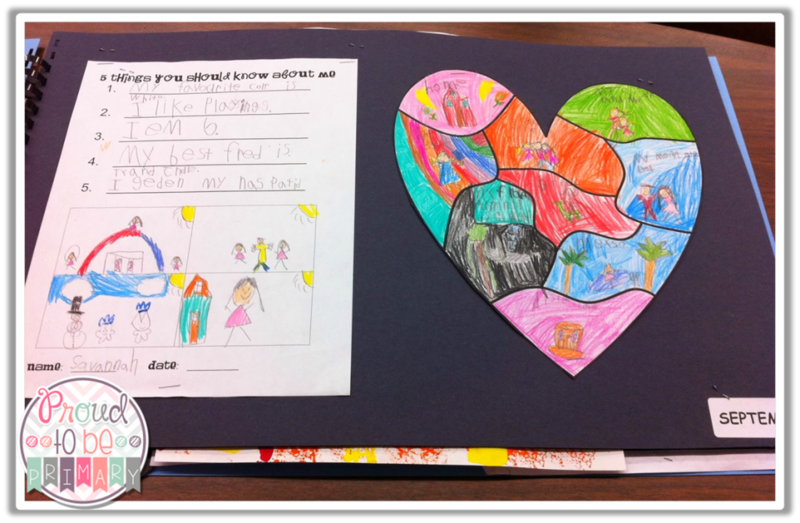 Do you use student-led conferences at your school to showcase student work? How does your school share student work and achievement with families? 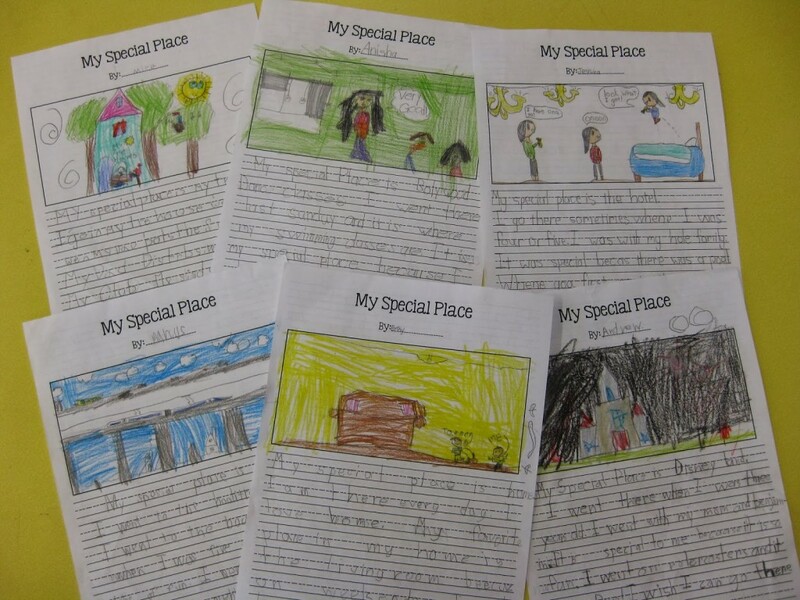 This week for writing we did a great “writing from our lives” lesson on our “special places”. First, I told the kids about a story of “my special place.” It was my childhood friend’s secret playroom in her closet. I described the place as well as I could so they would be able to visualize it (we are working on visualizing too at the moment). 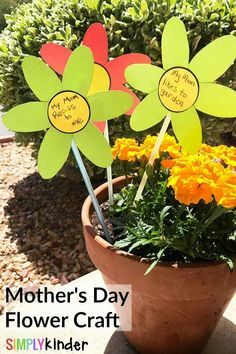 Then I had the kids close their eyes and image a place that they think is special to them, like a place they have visited, their bedrooms or backyards, or maybe their Grandma’s house. I prompted them to think about this place in detail, by having them think about what is around them, what they liked doing there, what makes it special, and how it makes them feel. Next, I told them to open their eyes and return to their desks where they would were to draw a detailed picture of their special place. Once everyone got started with their pictures, they were drawing so quietly I could tell they were very engaged in the lesson by how quiet it war! I stopped them after 10 minute of drawing to share with the person sitting next to them. I had them tell that person what their special place was and what they drew. I started the next part of the lesson the next day at the carpet reviewing our previous day’s learning. I had them turn to their neighbors to share about their special places but this time to go into more depth and talk about all the things they do or did there, who were they with, and to use their five senses (see, hear, taste, feel, smell) to come up with details about their places. After the sharing, they returned to their desks to start writing. They wrote for over 30 minutes straight and included tons of great details on their own. Here is a picture of some of the completed writing pieces. Have you ever used this as a writing topic? How do you help those who have a hard time coming up with ideas without taking away their creativity? 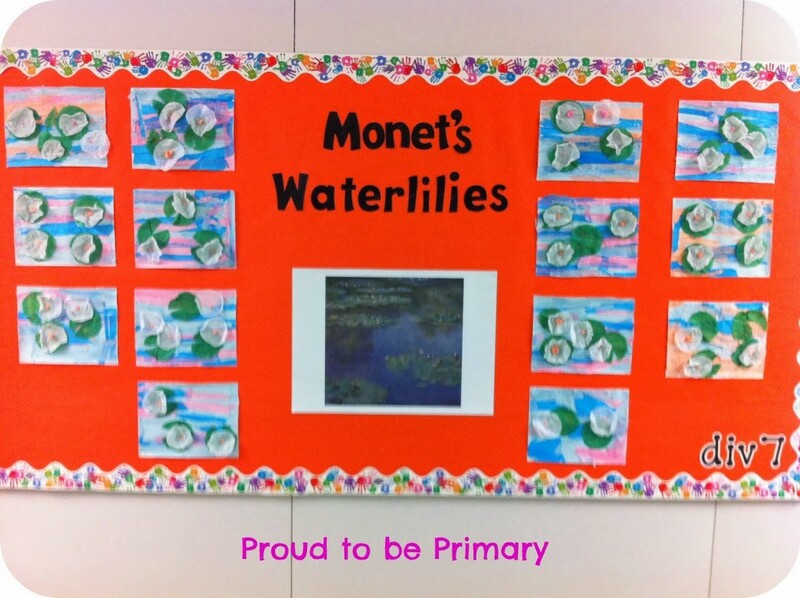 My student teacher, Christy, started her famous artists unit this week and the featured artist was Monet. She did a wonderful job introducing Monet by reading a children’s book about his life and showing pictures of his works of art (a few waterlily ones). The kids were so engaged and interested! 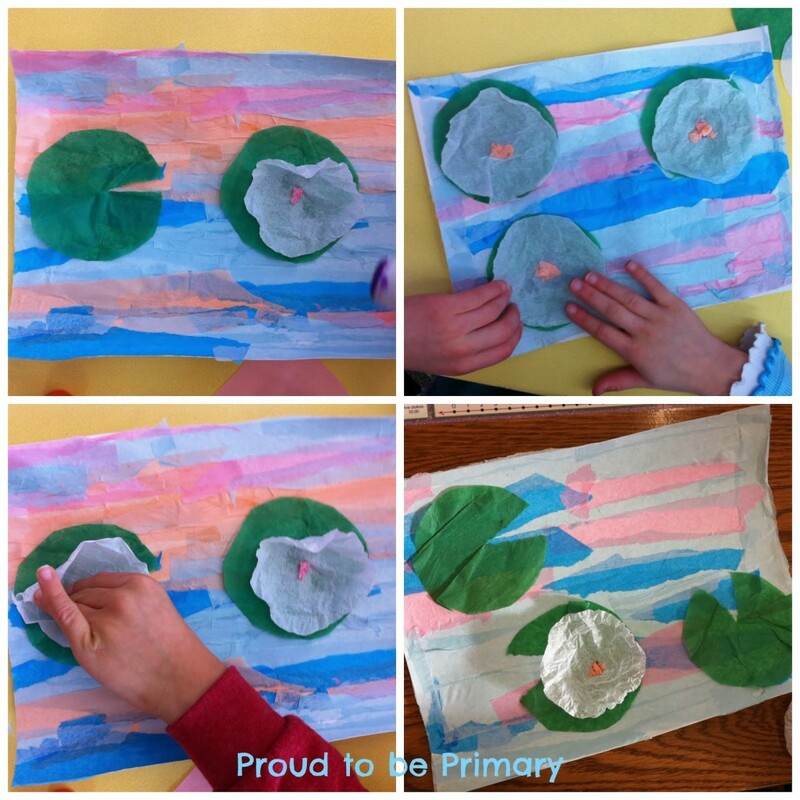 She then showed them her art and described how they would be making their own water pictures with waterlilies using tissue paper and white glue. water and the look of light reflecting. Next they added the lily pads and flowers on top of the water. It was so neat to see the class so quiet and focused and boy do I have some perfectionists!! They all did a great job and each one was so unique. The clean up was a BIG job but worth it when you see the end result!